On 14 April RWPGM Bro. William Steel and SPGM Bro. 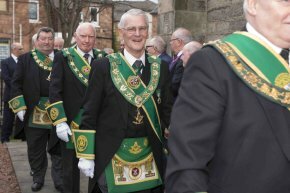 Stewart Cruickshank attended the Annual Divine Service of the Provincial Grand Lodge of Renfrewshire East held within the Rutherglen West and Wardlawhill Parish Church. The Service was conducted by Revd. Bro. Malcolm Cuthbertson. RWPGM Bro. Neil Fraser welcomed all and thanked those who assisted. On 13 April PPGM Bro. Archibald Chalmers and SPGM Bro. 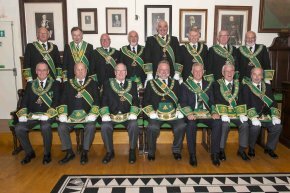 Stewart Cruickshank attended the Annual Installation of Elective Office-bearers at the Provincial Grand Lodge of Perthshire East where RWPGM Bro. 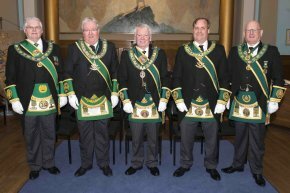 Russell Logan welcomed the Deputation from Sister Provinces headed by the RWPGM of Renfrewshire West Bro. Robin McIntyre. DPGM Bro. Ian Cameron and SPGM Bro. Robert Easton carried out the Installation. At the Installation of Elective Office-bearers for the Provincial Grand Lodge of Lanarkshire Middle Ward, RWPGM Bro. 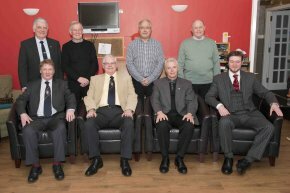 William Perry welcomed the Deputation from Sister Provinces headed by RWPGM of Dunbartonshire Bro. James Forrest. The RWPGM Bro. William Steel headed the Deputation from PGLA. At the Installation of Elective Office-bearers for the Provincial Grand Lodge of Stirlingshire, RWPGM Bro. 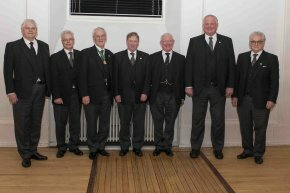 Alistair Marshall welcomed the Deputation from Sister Provinces headed by RWPGM of Glasgow Bro. James Peddie. SPGM Bro. Stewart Cruickshank represented PGLA. At the Installation of Elective Office-bearers for the Provincial Grand Lodge of Dumfriesshire, RWPGM Bro. Robert Hughes welcomed the Deputation from Sister Provinces headed by RWPGM of Dunbartonshire Bro. James Forrest. IPPGM Bro. 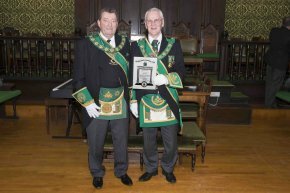 Robert Little represented PGLA with SPGM Bro. Stewart Cruickshank in attendance. The Immediate Past Provincial Grand Master Bro. 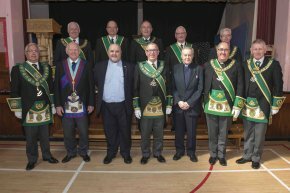 Robert Little headed the Deputation from the Provincial Grand Lodge of Ayrshire at the Installation of Office-bearers in the Provincial Grand Lodge of Kilwinning. On 1 February, RWPGM Bro. William Steel accompanied by IPPGM Bro. Robert Little and SPGM bro. 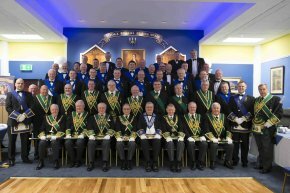 Stewart Cruickshank attended the Annual Installation of Elective Office-bearers at the Provincial Grand Lodge of Renfrewshire West held within the Masonic Temple of Lodge Greenock St. John’s No. 175. RWPGM Bro. Robin McIntyre welcomed the Deputation from the Sister Provincial Grand Lodges which was headed by RWPGM of the PGL of Dunbartonshire Bro. James Forrest. The Installation was carried out by DPGM Bro. John Black assisted by IPPGM Bro. James Livingston. 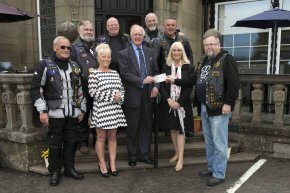 Following the meeting the brethren attended a meal which was followed by a presentation of a cheque for £1,000 to Children In Poverty, Inverclyde. On 26 January SPGM Bro. 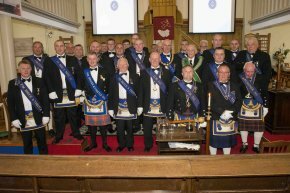 Stewart Cruickshank represented Provincial Grand Lodge of Ayrshire at the Annual Installation of Elected Office-bearers of the Provincial Grand Lodge of Renfrewshire East held within Lodge St. Johns Operative No.347 Temple. 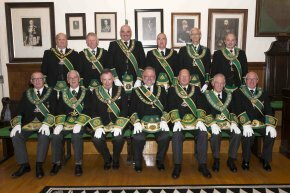 The Deputation from the Sister Provinces was headed by RWPGM of the Provincial Grand Lodge of Dumfriesshire Bro. Robert Hughes. RWPGM Bro. Neil Fraser extended a warm welcome to the visiting Provinces. The Installation was conducted by SPGM Bro. 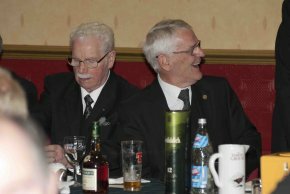 Alick Currie and SPGM Bro. Gavin Burt. On 25 November, RWPGM Bro. William Steel, SPGM Bro. Stewart Cruickshank and Bible-bearer Bro. 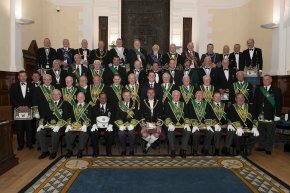 George Reid attended the Annual Divine Service of the Provincial Grand Lodge of Glasgow. The service was conducted by Bro. Revd. Ian Taylor in Springfield Cambridge Parish Church. RWPGM of Glasgow PGL Bro. James Peddie extended a warm welcome to all in attendance. On 30 June RWPGM Bro. 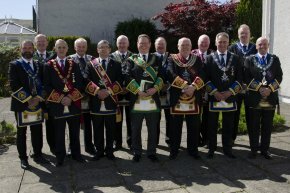 William Steel headed a Deputation from the Provincial Grand Lodge of Ayrshire and the Deputation of Sister Provincial Grand Lodges into the Masonic Temple in Kilwinning for the Installation of the Provincial Grand Master and the Commissioned Office-bearers of the Provincial Grand Lodge of Kilwinning. The Deputation was welcomed by PPGM Bro. 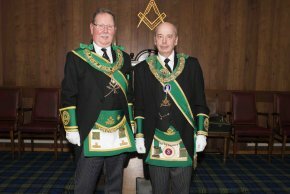 David Bloomfield who then welcomed a Deputation from the Grand Lodge of Scotland headed by the MWGMM Charles I. R. Wolrige Gordon of Esslemont. MWGMM Bro. 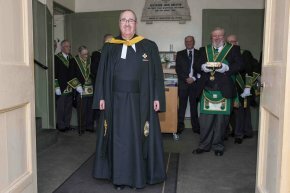 Charles I. R. Wolrige Gordon of Esslemont then Installed Bro. 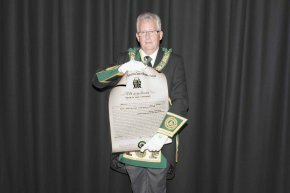 Thomas Wood as Right Worshipful Provincial Grand Master, Bro. 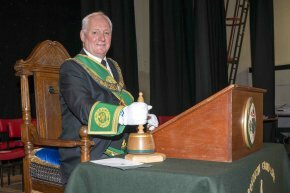 James Brennan as DPGM, Bro. Robert McCrea as SPGM, Bro. Terrance Galloway as Provincial Grand Secretary and Bro. George T. Stoddart as Provincial Grand Chaplain. The MWGMM was assisted by Grand Secretary, Bro. Euan Edment, Grand Director of Ceremonies Bro. William H Gauld and Grand Chaplain Bro. Iain Ramsden. 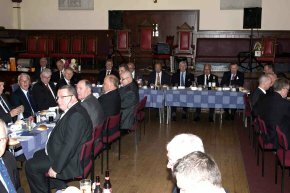 On completion of the Installation the Brethren retired to enjoy a dinner followed by the customary toasts with RWPGM Bro. 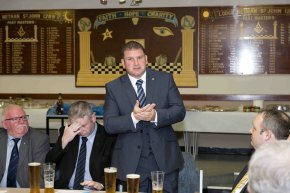 William Steel proposing the toast to the Provincial Grand Lodge of Kilwinning. 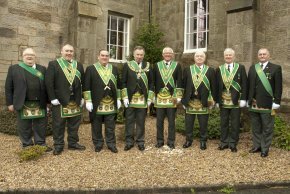 Provincial Grand Lodge of Ayrshire was well represented at the annual BBQ held at Marcus Humphrey House on 9 June. The RWPGM Bro. William Steel was in attendance along with his Depute Bro. James Bell, SPGMs Bro. Stephen McConnachie and Bro. Stewart Cruickshank and PSPGW Bro. William Burgess. Bro. Liam Stewart was also in attendance and provided some musical entertainment. Bro. Colin Hannah PM Lodge St. John Royal Arch No.320 also attended. 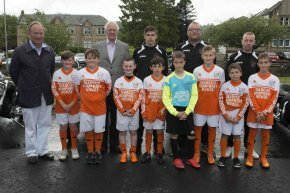 The opening remarks were given by Marcus Humphrey of Dinnet, and the BBQ was opened by Provost Brennan of Inverclyde Council. 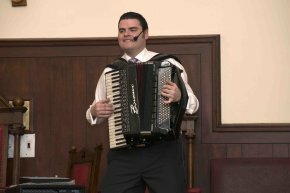 Entertainment was provided by Michael Dailly – Pipes, Liam Stewart – Accordion, Nicol Boyle Highland Dancers and Star Wars Entertainers. Baked Potatoes and Hot Dogs were available together with various stalls. Several cheques were received by Marcus Humphrey of Dinnet, Mrs. Dawn Oliff, Homes and Charities Manager and Alan Sorenson, Deputy Lord Lieutenant of Renfrewshire. These included a donation by the RWPGM Bro. 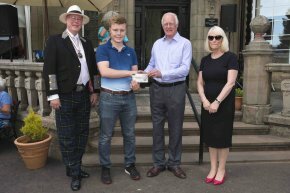 William Steel on behalf of PGLA and a donation on behalf of Lodge Ayr St. Paul No.204. The day was concluded by a vote of thanks by Marcus Humphrey of Dinnet. On 5 June PPGM Bro. Archibald Chalmers and SPGM Bro. Stewart Cruickshank joined the Provincial Grand Lodge of Argyll and the Isles Deputation headed by RWPGM Bro. Kenneth Johnson, attending the regular meeting of Lodge Earraghaidheal No.1822, where RWM Bro. John Corbett extended a warm welcome. PPGM Bro. Archibald Chalmers delivered his paper on Bro. David Murray Lyon, which was well received. RWPGM Bro. Kenneth Johnson then carried out the business of the annual Provincial Visitation and granted 1822 a clear minute. 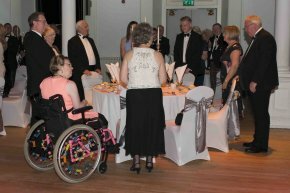 On 19 May the Provincial Grand Lodge of Renfrewshire West held their Annual Gala Ball held in Greenock Town Hall. After an enjoyable meal the entertainment was provided by the Capitol Big Band. 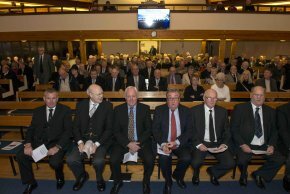 A number of Provinces were represented with Ayrshire being represented by IPPGM Bro. Robert Little, PPGM Bro. Archie Chalmers, Bro. Stewart Cruickshank and Bro. Tom Smith PM 331 accompanied by Mrs. Sadie Chalmers and Mrs Sandra Smith. On 13 May IPPGM Bro. Robert Little and SPGM Bro. 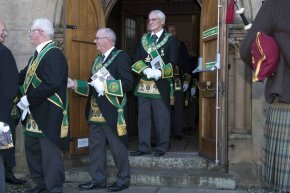 Stewart Cruickshank attended the Provincial Grand Lodge of Dunbartonshire Annual Divine Service held in Alexandra Parish Church. The Service was conducted by Rev. 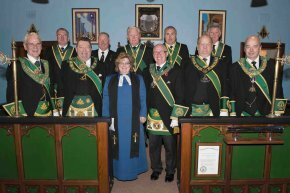 Elizabeth Houston and PGL Grand Chaplain Bro. Revd. Mark E. Johnstone. RWPGM Bro. James Forrest extended a warm welcome and thanks to all for attending. Photographs courtesy of Bro. Nigel Hutchins PGL Dunbartonshire. On 4 May IPPGM Bro. Robert Little and SPGM Bro. 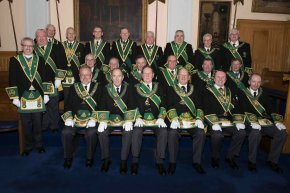 Stewart Cruickshank attended the annual Installation of Elective Office-bearers of PGL of Lanarkshire Upper Ward. The Deputation of Sister PGLs was headed by RWPGM Bro. 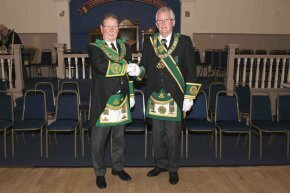 William Perry of the Provincial Grand Lodge of Lanarkshire Middle Ward and the Deputation was welcomed by RWPGM Bro. Alexander Thomson. Provincial Junior Grand Chaplain Bro. Alan Gibb and Provincial Grand Treasurer Bro. Gordon Duffin then Installed the Elective Office-bearers. On the evening of 29 April, RWPGM Bro. William Steel, IPPGM Bro. Robert Little, PPGM Bro. Archibald Chalmers and SPGM Bro. 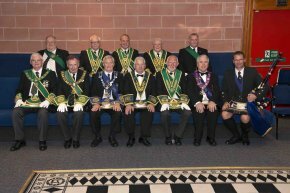 Stewart Cruickshank attended the Annual Divine Service of the Provincial Grand Lodge of Lanarkshire Middle Ward. The service was once again conducted by Rev. Fiona McKibbin in Uddingston Old Parish Church. RWPGM Bro. 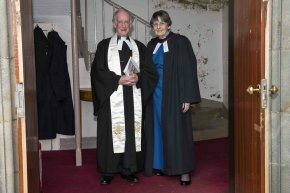 William Perry extended a warm welcome to all and after the service gave a vote of thanks to Rev Fiona McKibben, the organist, the Ladies who made and served the tea and coffee, and all for attending. On 14 April, RWPGM Bro. William Steel, IPPGM Bro. Robert Little and SPGM Bro. 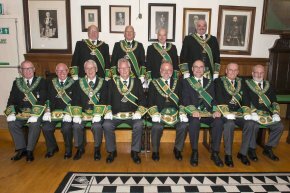 Stewart Cruickshank attended the Installation of Elective Office-bearers at the Provincial Grand Lodge of Perthshire East. RWPGM Bro. William Steel headed the Deputation of visiting Sister Provincial Grand Lodges. 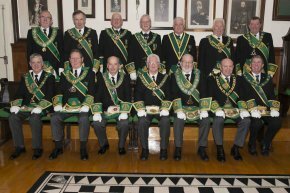 RWPGM of Perthshire East Bro. 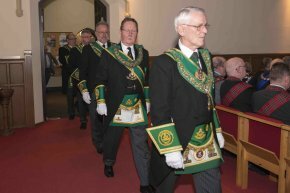 Russell Logan, welcomed the Deputation and then proceeded with the Installation with the assistance of DPGM Bro. 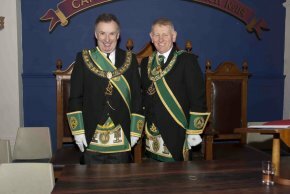 Iain Cameron and SPGM Bro. Robert Easton. On 6 April, IPPGM Bro. Robert Little and SPGM Bro. 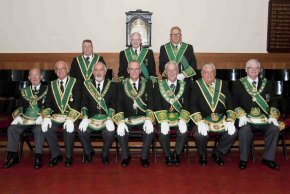 Stewart Cruickshank joined a Deputation of Sister Provincial Grand Lodges at the Annual Installation of Elective Office-bearers of the Provincial Grand Lodge of Lanarkshire Middle Ward. The Deputation was welcomed by RWPGM Bro. William Perry. PPGSW Bro. Alexander Hamilton obligated the Office-bearers and SPGMs Bro. Norman Carnegy and Bro. 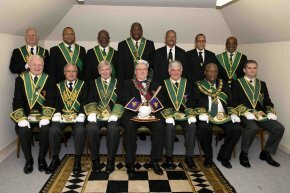 Alexander Kelly installed the Elective Office-bearers for the year 2018. On 17 March, RWPGM Bro. William Steel headed a Deputation from the Provincial Grand Lodge of Ayrshire to join a Deputation of Sister Provincial Grand Lodges headed by RWPGM Bro. 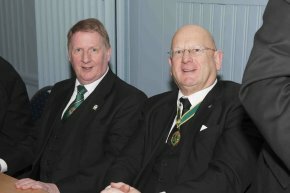 William Perry of Lanarkshire Middle Ward at the Installation of the Provincial Grand Master and the Commissioned Office-bearers of the Provincial Grand Lodge of Renfrewshire West in Greenock Town Hall. The Deputation was welcomed by IPPGM Bro. James Livingstone who then welcomed a Deputation from the Grand Lodge of Scotland headed by Immediate Past Depute Grand Master Mason Bro. Ramsay McGhee. IPDGMM Bro. Ramsay McGhee then Installed Bro. 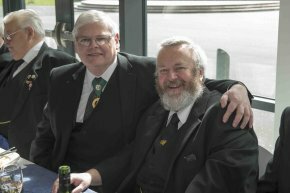 Robert McIntyre as Right Worshipful Provincial Grand Master John Black as DPGM and Bro. Stuart Wilson as SPGM. Past Substitute Grand Master Bro. 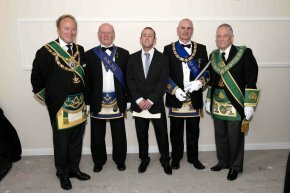 Alexander Galbraith then Installed Bro. Alan Beck as Provincial Grand Secretary and Bro. George Carson as Provincial Grand Chaplain. 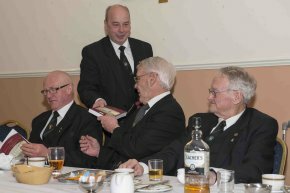 On completion of the Installation the Brethren retired to enjoy a dinner followed by the customary speeches. On 11 March, RWPGM Bro. William Steel, IPPGM Bro. Robert Little and SPGM Bro. 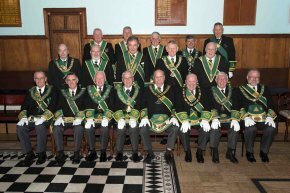 Stewart Cruickshank attended the Provincial Grand Lodge of Stirlingshire Annual Divine Service. 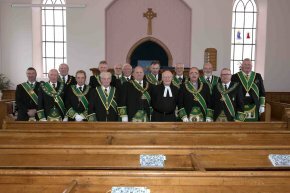 The service was held in the Tulliallan and Kincardine Parish Church and was conducted by Bro. Rev. Andrew Paterson. RWPGM Bro. Alistair Marshall extended a warm welcome to all, and gave a vote of thanks to Lodge St. John Tulliallan No.598 for their catering and hospitality. On 23 February RWPGM Bro. 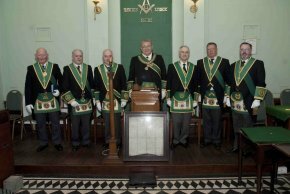 William Steel headed a Deputation from the Provincial Grand Lodge of Ayrshire to join the Sister Provincial Grand Lodges Deputation to the Provincial Grand Lodge of Dumfriesshire. RWPGM Bro. Robert Hughes extended a warm welcome to all on the occasion of the Installation of elective Office-bearers. On 20 February RWPGM Bro. 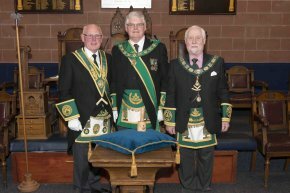 William Steel headed a Deputation from the Provincial Grand Lodge of Ayrshire to join a Deputation from Sister Provincial Grand Lodges into the Provincial Grand Lodge of Kilwinning. The Deputation of Sister Provincial Grand Lodges was headed by RWPGM Bro. William Steel. IPPGM David Bloomfield welcomed the Deputation. RWPGM Designate Bro. Thomas Wood installed the elective Office-bearers. After the completion of the business, IPPGM Bro. 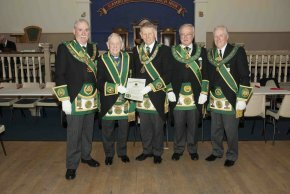 David Bloomfield conferred Honorary Membership of the Provincial Grand Lodge of Kilwinning on IPPGM Bro. Robert Little. The new Grand Secretary, Bro. 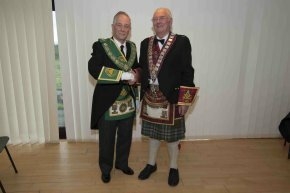 Euan Edment, along with the new RWPGM of Ayrshire Bro. 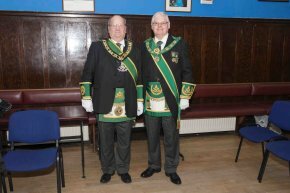 William Steel and the new RWPGM of Renfrewshire West Bro. 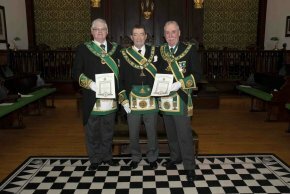 Robert McIntyre, attended the spring Communication of the Grand Lodge of Scotland on 1 February. On 2 February IPPGM Bro. Robert Little, PPGM Bro. 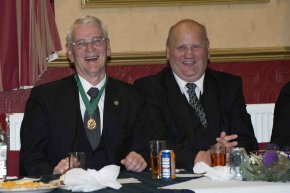 Archibald Chalmers and SPGM Bro. 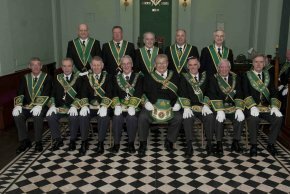 Stewart Cruickshank attended the Annual Installation of elective Office-bearers of the Provincial Grand Lodge of Renfrewshire West. RWPGM Bro. Robin McIntyre welcomed the Deputation of Sister Provincial Grand Lodges headed by IPPGM Bro. Robert Little. RWPGM Bro. Robin McIntyre installed his elective Office-bearers in an excellent manner. After the Installation an enjoyable meal was served. On 10 December RWPGM Bro. 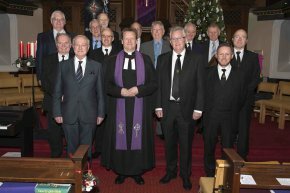 Robert Little attended the Provincial Grand Lodges of Lanarkshire Middle and Upper Wards Annual Carol Service in Newarthill and Carfin Parish Church. The Service was conducted by the Rev. Elaine McKinnon and Rev. Shaw Paterson. Bro. 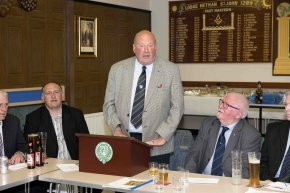 William Perry RWPGM of Lanarkshire Middle Ward, welcomed all in attendance. Scripture Readings were given by the following Brethren. Bro. 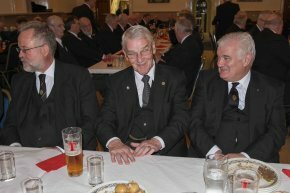 Alexander Thomson RWPGM Lanarkshire Upper Ward, Bro. 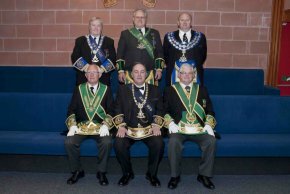 George Carnegie MWS Lanarkshire Sovereign Chapter, Bro. 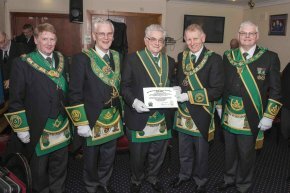 Kenneth D. Kennedy PSGR Order of the Secret Monitor West Scotland, Bro. Robert SM Stewart District Grand Prior District Grand Priory of Strathclyde, Bro. 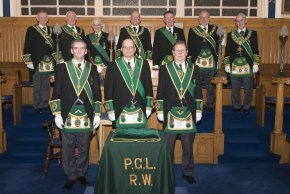 Andrew Millar PGC Lanarkshire Sovereign Council and Bro. Alexander Brown Grand Superintendent PGRAC. Bro. Ian Gordon Int. Gen. for Clydesdale GIC gave a vote of thanks including thanks to Lodge Robert King Stewart No.919 for tea, coffee and baking etc. On 6 November IPPGM Bro. 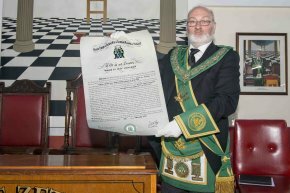 Archibald Chalmers held the position of Junior Deacon at Lodge the Prince's No.607 where a FC degree was conferred on one candidate by a Deputation of Reigning Commissioned Provincial Office-bearers headed by Right Worshipful Provincial Grand Master of Glasgow Bro. James C. Peddie. 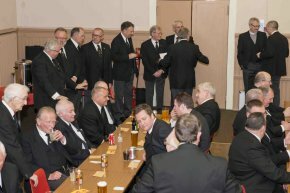 The Deputation, included Provincial Office-bearers not taking part in the degree, was welcomed in to the Lodge by RWM Bro. Tony Stewart. On 5 November RWPGM Bro. 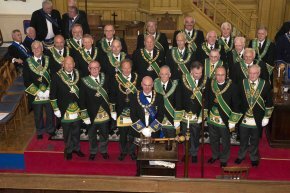 Robert Little and several Brethren from the Provincial Grand Lodge of Ayrshire, attended the Annual Divine Service of the Provincial Grand Lodge of Glasgow. The service was held in Sherbrooke St. Gilbert Parish Church. Bro. Rev. Gordon B. Armstrong delivered the Sermon with the rest of the service being conducted by Rev. Tom Pollock. RWPGM Bro. James C. Peddie extending a warm welcome to all. On 21 October, PGLA Bard Bro. Stewart Cruickshank and PGLA Vice President of Stewards Bro. 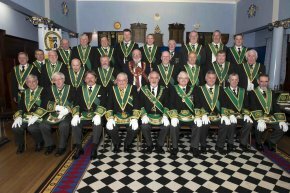 Murray Hunter attended the Installation of Lodge Earraghaidheal No.1822 for the Annual Installation. 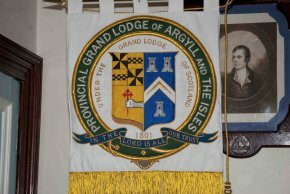 PG Bard joined the Provincial Grand Lodge of Argyle and the Isles Deputation headed by RWPGM Bro. Kenneth Johnson. The Installing Masters were IPPGM Bro. Douglas Craig PM Lodge Oban Commercial No.180 and PGL Steward Bro. Darren McLaughlan RWM Lodge Kelburne No.459. Bro. Murray Hunter was installed as WSW of Lodge Earraghaidhea No.1822. After speaking for PGL RWPGM Bro. 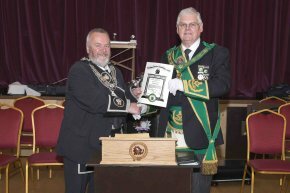 Kenneth Johnson conferred Honorary Provincial Grand Rank of Piper on Bro. 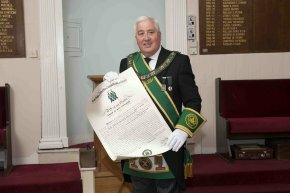 Donald Campbell Files and Honorary Provincial Grand Rank of Senior Grand Deacon on Bro. Stewart Cruickshank. On 15 October RWPGM Bro. 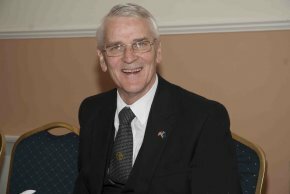 Robert Little headed a Deputation from the Provincial Grand Lodge of Ayrshire to the Provincial Grand Lodge of Galloway Divine Service. The Service was held in the premises of Luce Abbey, Glenluce and was conducted by Revd. Fiona Wilson. 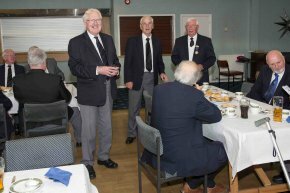 After the service, a meal was enjoyed by all at the local Golf Club. On 8 October RWPGM Bro. 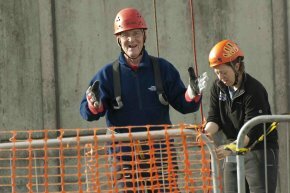 Robert Little took part in an Abseil at the Falkirk Wheel. 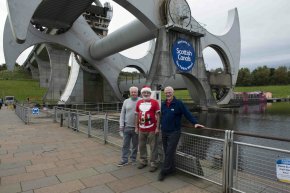 The event was organised by the Provincial Grand Lodge of Stirlingshire and the RWPGM of Stirlingshire took part in his now familiar costume as Santa. The main charity to benefit from the event is Maggie’s. 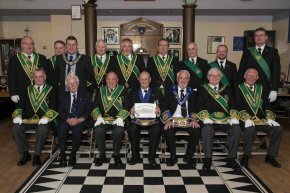 On 15 August the Provincial Grand Lodge of Kilwinning held their Summer Communication in the Masonic Temple in Kilwinning where RWPGM Bro. 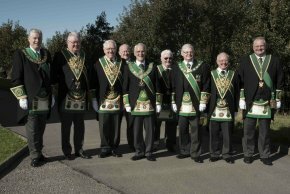 T. Wilson Aitken welcomed a large Deputation for Sister Provinces. RWPGM Bro. 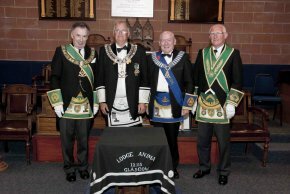 Robert Little headed the Deputation from the Provincial Grand Lodge of Ayrshire. After the PGL business was complete, IPPGM PGLA, Bro. Archie Chalmers presented a talk on Bro. David Murray Lyon. On 1 July, RWPGM Bro. Robert Little, DPGM Bro. William Steel and PG Bard Bro. Stewart Cruickshank joined the Deputation of Sister Provincial Grand Lodges at the the Installation of RWPGM Bro. 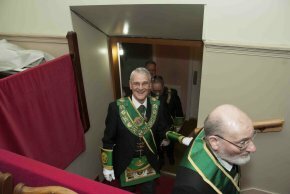 Russell Logan in the Provincial Grand Lodge of Perthshire East. RWPGM Bro. 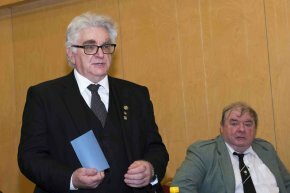 Andrew Lawrie, of Aberdeenshire West headed the Deputation of Sister Provincial Grand Lodges. The MWGMM Bro. Charles I.R. 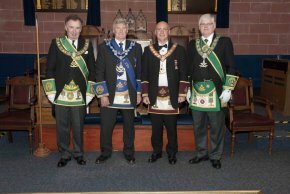 Wolrige Gordon of Esslemont, installed RWPGM Bro. Russell Logan and his Commissioned Office-bearers. At the celebration Dinner RWPGM Bro. 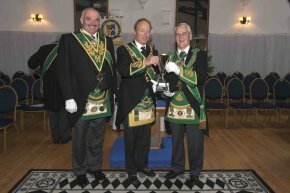 Robert Little proposed the toast to the Provincial Grand Lodge of Perthshire East. RWPGM Bro. 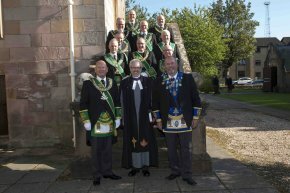 Robert Little, along with a Deputation from the Provincial Grand Lodge of Ayrshire, joined the Deputations of Sister Provincial Grand Lodges at he the Installation of the RWPGM in the Provincial Grand Lodge of Fife and Kinross on 17 June. Bro. Dougie Fergie, RWPGM of East Lothian and Berwickshire headed the Deputation of Sister Provincial Grand Lodges. The MWGMM Bro. Charles I.R. 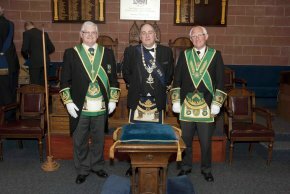 Wolrige Gordon of Esslemont, installed RWPGM Bro. Stewart Quigley. 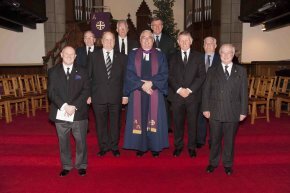 DGMM Bro Ramsay McGhee and SGMM Bro Hugh Clelland Installed the Commissioned Office-bearers. On 6 June, IPPGM Bro. Archibald Chalmers and Bro. Stewart Cruickshank joined the Deputation from the Provincial Grand Lodge of Argyll and the Isles headed by RWPGM Bro. Kenneth Johnson into Lodge Earraghaidheal No.1822. RWM Bro. John Corbett welcomed the Deputation into the Lodge. IPPGM Bro. Archibald Chalmers then presented his talk on the Copy Cats of Freemasonry which was well received. Oh completion of the talk, RWM Bro. John Corbett conferred Honorary Membership of Lodge 1822 on RWPGM Bro. Kenneth Johnson and IPPGM Bro. Archibald Chalmers. RWPGM Bro. Kenneth Johnson then carried out the business of the Annual visitation and granted Lodge 1822 a clear minute. On 27 May RWPGM Bro. Robert Little, Bro. Tom Smith PM 331 accompanied by Mrs Sandra Smith and Bro. 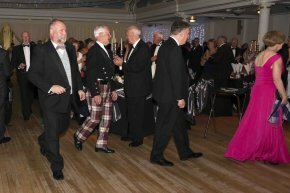 Stewart Cruickshank attended the Annual Gala Ball hosted by the Provincial Grand Lodge of Renfrewshire West. RWPGM Bro. 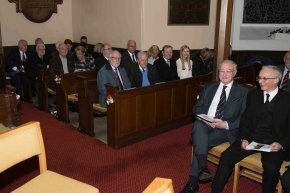 James Livingstone welcomed the Brethren and their Ladies to the Town Hall in Greenock. 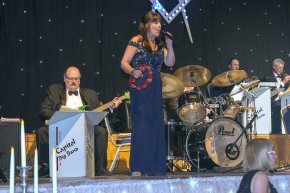 After an enjoyable meal the entertainment was provided by the Capitol Big Band, with the dance floor full for most of the evening. During the evening RWPGM Bro. James Livingston presented a cheque to Reach for Autism for £10,000. On the evening of 30 April, RWPGM Bro. Robert Little, IPPGM Bro. Archibald Chalmers, DPGM Bro. William Steel and Bro. 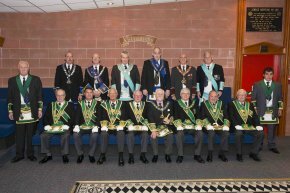 Stewart Cruickshank attended the Annual Divine Service of the Provincial Grand Lodge of Lanarkshire Middle Ward. The service was conducted by Rev. Fiona McKibbin in Uddingston Old Parish Church. IPPGM Bro. Thomas Davidson extended a warm welcome to all. On 23 April, RWPGM Bro. 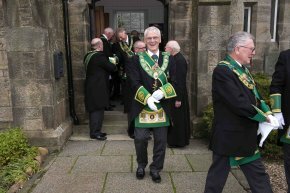 Robert Little headed a Deputation from the Provincial Grand Lodge of Ayrshire to the Annual Divine Service of the Provincial Grand Lodge of Fife and Kinross. The Service was conducted in Dunfermline Abbey by Revd. Canon J.J. Morrow PGMM, The Lord Lyon, King of Arms, Revd. 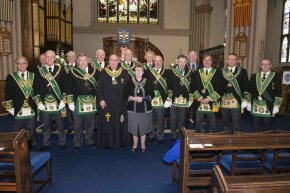 Mary Ann R. Rennie (Minister of Dunfermline Abbey) and RWPGM of Fife and Kinross, Bro. Revd. Andrew Paterson. At the conclusion of the service, a Buffet was provided in the Town hall. On 5 March RWPGM Bro. 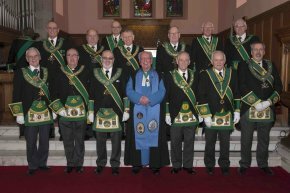 Robert Little headed a Deputation from Provincial Grand Lodge of Ayrshire to join the Deputation of Sister Provincial Grand Lodges at the Annual Divine Service of the Provincial Grand Lodge of Stirlingshire. RWPGM Bro. Alistair Marshall extended a warm welcome to all the visitors. 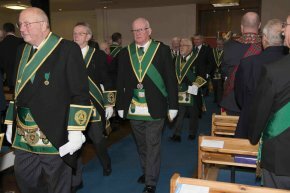 The Service was held in The Allan Church of Scotland, Bannockburn and was conducted by Bro. Rev. James Landels. On 3 March RWPGM Bro. 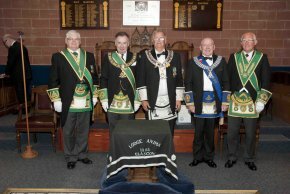 Robert Little headed a Deputation from the Provincial Grand Lodge of Ayrshire within a deputation of Sister Provincial Grand Lodges at the Annual Installation of Elective Office-bearers of the Provincial Grand Lodge of Lanarkshire Middle Ward. The Deputation was welcomed by RWPGM Bro. William Perry. A Deputation from the Grand Lodge of Scotland, headed by Depute Grand Master Bro. Ramsay McGhee was also welcomed by RWPGM Bro. William Perry. Provincial Grand Chaplains Bro. Re. James Fergusson and Bro. Rev. James Vasey assisted by PPGSW Bro. Robert Stanfield obligated and installed the elective Office-bearers for the year 2017. On 25 February RWPGM Bro. 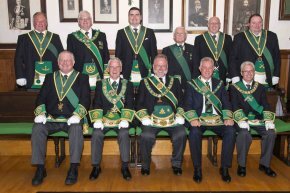 Robert Little accompanied by PGLA Bard Stewart Cruickshank attended the annual Installation of Elective Office-bearers at the Provincial Grand Lodge of Stirlingshire where RWPGM Bro. 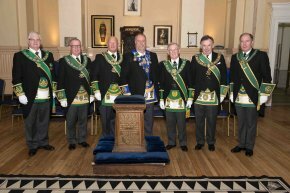 Alistair Marshall extended a warm welcome to the Deputation from Sister Provincial Grand Lodges which was headed by RWPGM East Lothian and Berwickshire Bro. Douglas Fergie. 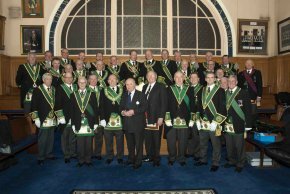 The Installation was carried out by SPGMs Bro. Alexander Thomson and Bro. Brian Wright. After the meeting a meal was enjoyed by all. On 24 February RWPGM Bro. Robert Little accompanied by IPPGM Bro. Archibald Chalmers, DPGM Bro. William Steel and PGLA Bard Bro. 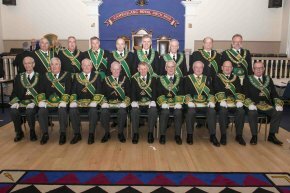 Stewart Cruickshank attend the Annual Installation of Elective Office-bearers at the Provincial Grand Lodge of Dumfriesshire where RWPGM Bro. Robert Hughes extended a warm welcome to the Deputation from Sister Provincial Grand Lodges which was headed by RWPGM of PGL Ayrshire Bro. Robert Little. The Installation was carried out by DPGM Bro. John Dunlop and Provincial Grand Almoner Bro. William Kerr. After the meeting a meal was enjoyed by all. On 4 February, RWPGM Bro. Robert Little, DPGM Bro. William Steel and Bro. 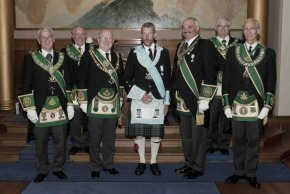 Stewart Cruickshank, joined a Deputation of Sister Provincial Grand Lodges at the Installation of the RWPGM of Edinburgh Bro. Norman MacLeod and his Commissioned Office-bearers. 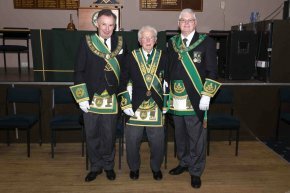 Retiring RWPGM Bro. 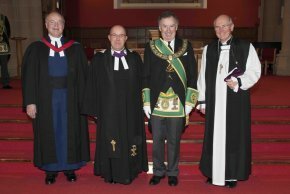 Ewan Rutherford welcomed the Deputation into the Provincial Grand Lodge of Edinburgh. The deputation was headed by RWPGM Bro. Kenneth Johnson of the Provincial Grand Lodge Argyle and the Isles. 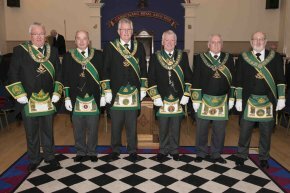 The Installation of the RWPGM and his Commissioned Office-bearers was carried out by Depute Grand Master Bro. Ramsay McGhee assisted by Grand Director of Ceremonies Bro. William H Gauld. 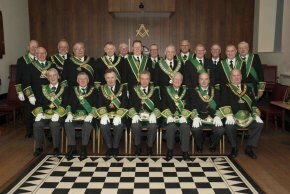 The ceremony and following meal were held in Grand Lodge. After the meal, the usual toasts were observed. On 3 February, RWPGM Bro. Robert Little, DPGM Bro. William Steel, IPPGM Bro. Archibald Chalmers and Bro. 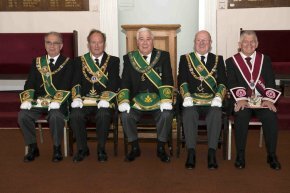 Stewart Cruickshank, joined a Deputation of Sister Provincial Grand Lodges at the Annual Installation of Office-bearers of the Provincial Grand Lodge of Renfrewshire West. RWPGM Bro. 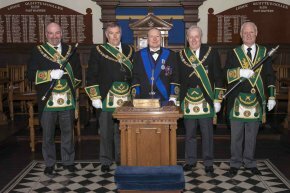 James Livingstone welcomed the Deputation into the Provincial Grand Lodge. The Deputation was headed by RWPGM Bro. 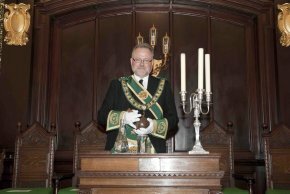 James Forrest Provincial Grand Lodge of Dunbartonshire. The Installation of Office-bearers was carried out by SPGM Bro. Robert Shields. After the meeting all who stayed were treated to the usual meal with RWPGM Bro. 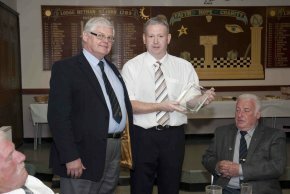 James Livingstone presented the Citizen of the year award to Kirsty McCarthy representing REACH for Autism Inverclyde. On 28 January, RWPGM Bro. 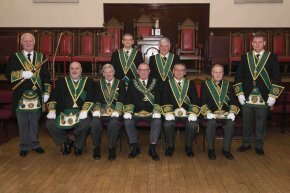 Robert Little headed a Deputation from the Provincial Grand Lodge of Ayrshire to join the Deputation from Sister Provincial Grand Lodges into the Annual Installation of Elected Office-bearers of the Provincial Grand Lodge of Renfrewshire East. The Deputation consisted of DPGM Bro. William Steel, SPGM Bro. Stephen McConnachie, PSPGM Bro. John Taylor and PGLA Bard Bro. Stewart Cruickshank. RWPGM Bro. John Miller welcomed the Deputation and then welcomed a Deputation from The Grand Lodge of Scotland headed by Past Depute Grand Master Bro. Archibald McGowan. On completion of the business including the Annual Reports of the Secretary and treasurer, RWPGM Designate, Depute PGM Bro. 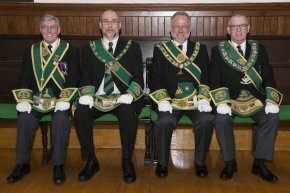 Neil Fraser then installed the Elective Office-bearers and Stewards for the year 2017-18. After the installation, RWPGM Bro. John Miller assisted by Past Depute Grand Master Bro. Archibald McGowan, conferred Honorary Provincial Grand Rank as follows:- Provincial Grand Director of Ceremonies Bro. 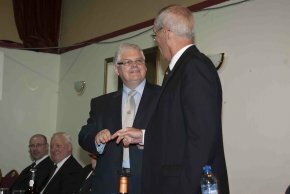 Brian Shields as Honorary Assistant Provincial Grand Secretary; Bro. Gordon Fleming as Honorary Provincial Assistant Grand Treasurer and PGLA Bard Bro. 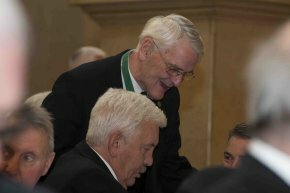 Stewart Cruickshank as Honorary Provincial Grand Architect. The first two Brethren were presented with neck jewels by their Lodges while RWPGM Bro. John Miller presented Bro. Stewart Cruickshank with a jewel from the Province. Provincial Grand Treasurer of 19years, Bro. 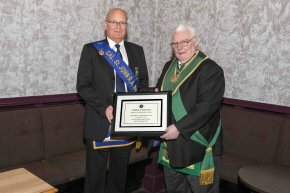 Clark Leiper was then presented with a certificate for his award of Honorary Grand treasurer. 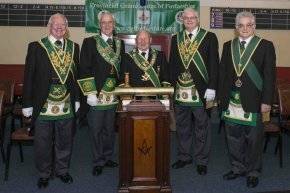 RWPGM then presented a Past Senior Provincial Grand Warden's Apron to Bro. George Bell in recognition for the service given to the Province. On 13 January, IPPGM Bro. Archibald Chalmers and Bro. 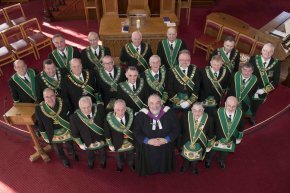 Stewart Cruickshank represented the Provincial Grand Lodge of Ayrshire in the Deputation of Sister Provincial Grand Lodges at the Annual Installation of Elective Office-bearers at the Provincial Grand Lodge of Perthshire East. The meeting was held in the premises of Scone and Perth No.3. After welcoming the Deputation, RWPGM Bro. Ronald Forbes installed the elective Office-bearers. After the meeting a pleasant time was spent in harmony. On 11 December, RWPGM Bro. Robert Little, IPPGM Bro. Archibald Chalmers and Bro. 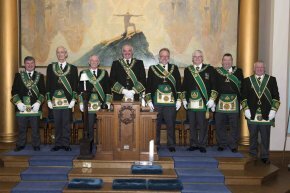 Stewart Cruickshank attended the Annual Carol Service of the Masonic Orders in Lanarkshire. The service was held in Hamilton Old Parish Church and was conducted by Rev. Ross Blackman. RWPGM Bro. 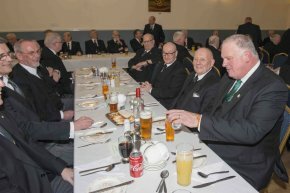 William Perry extended a warm welcome to all and Lodge Hamilton Kilwinning No.7 provided the refreshments at the end of the Service. 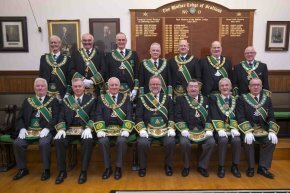 On Thursday 24 November 2016 the MWGMM Bro. 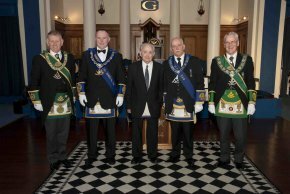 Charles Ian Robert Wolrige Gordon of Esslemont, was Installed for the ninth time as the Head of Scottish Freemasonry by Past GMM Bro. Marcus Humphrey of Dinnet. 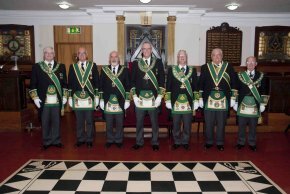 The Installation of the Office-bearers was conducted by Depute Grand Master Bro. Ramsay McGhee and Substitute Grand Master Bro. Hugh Clelland. This included Ayrshire members Bro. James Bell as Grand Treasurer, Bro. Sam Peden as Grand Jeweller and Bro. Archie Chalmers as Senior Grand Marshal. 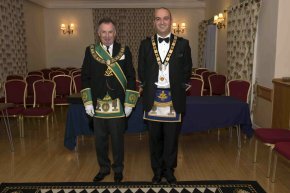 At the conclusion of the Installation, Grand Secretary intimated that Bro. Ian Taylor PM No.135, Bro. John McMaster PM No.566 and Bro. 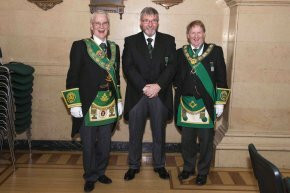 Neil Mitchell PM No.331, had been granted Honorary Grand Rank. 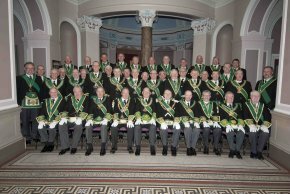 Thereafter the Brethren adjourned to the Edinburgh Corn Exchange to celebrate the Festival of St Andrew. On Tuesday 22 November 2016 Bro. John Muir PM 1779, MM 195 & 1759, achieved the distinction of having visited EVERY Lodge in Scotland. 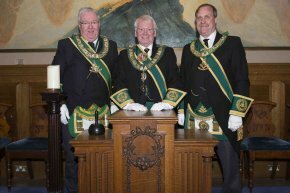 His last visitation was to Lodge Ruchill No.1436 in Glasgow where we witnessed an excellent FC Degree conferred by IPM Bro. Gordon Hughes and Brethren of Dalry Blair Lodge No.290. The RWM of the host Lodge, Bro. Andrew McMillan, presented Bro. Muir with a framed Diploma to mark the occasion. 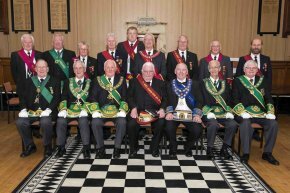 Amongst the many Brethren present to witness the momentous event were Depute Grand Master Bro. 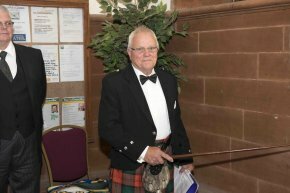 Ramsay McGhee; RWPGM of Ayrshire Bro. Robert Little, RWPGM Lanarkshire Middle Ward Bro. 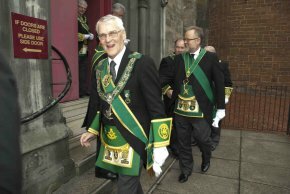 Bill Perry, SPGM's of Glasgow Bro. Jim McMillan and Bro. Bill Newlands and numerous others. 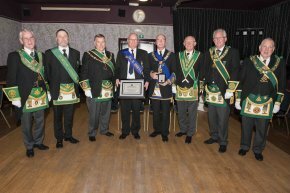 Brother Muir presented each brother present with a commemorative token for which generous donations were made to the RWM's Charity Fund in appreciation of the gesture. The last Brother to make this wonderful journey around Scotland, Brother Iain Gemmell of Lodge St. James Newton-upon-Ayr No.125 was also present. On 6 November RWPGM Bro. 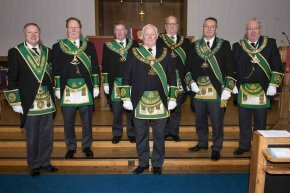 Robert Little and several Brethren from the Provincial Grand Lodge of Ayrshire, attended the Annual Divine Service of the Provincial Grand Lodge of Glasgow. The service was held in Sherbrooke St. Gilbert Parish Church. Bro. Rt. Rev. Dr. Idris Jones conducted the service with a welcome given by Rev. Tom Pollock. On 16 October, RWPGM Bro. Robert Little Bro. Iain Gemmell and Bro. Stewart Cruickshank. 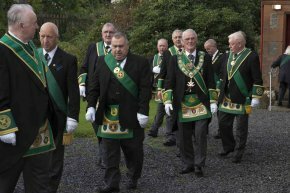 attended the Divine Service held in Glenluce by the Provincial Grand Lodge of Galloway. The Service was conducted by Rev. Fiona Wilson. RWPGM Bro. John Henderson extended a warm welcome to all. After the service, a meal was supplied at the local Golf Club. On 15 October IPPGM Bro. Archibald Chalmers, Bro. Iain Gemmell and Bro. 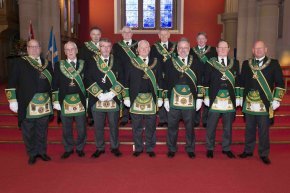 Stewart Cruickshank attended the Installation of Lodge Earraghaidheal No.1822, where they joined the Deputation from the Provincial Grand Lodge of Argyll and The Isles headed by Provincial Grand Chaplain Bro. Kenneth Harvey. Installing Masters Bro. Donald Bannatyne PM Lodge St. Molios No.774 Depute Provincial Grand Master and Bro. Murray Hunter, PM Lodge Stinchar Valley No.1705, Provincial Grand Steward PGLA installed Bro. John Corbett and his Office-bearers. On 1 October, IPPGM Bro. Archibald Chalmers, Bro. Iain Gemmell and Bro. 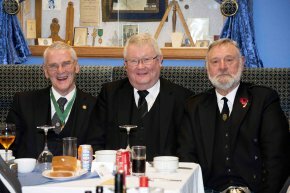 Stewart Cruickshank represented PGLA at the 225th rededication of Lodge Oban Commercial No.180. RWM Bro. Kenneth Stewart welcomed the PGL Deputation into the Lodge. 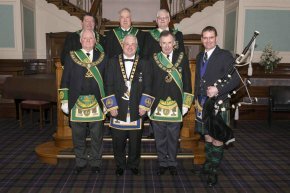 The ceremony was carried out by the RWPGM of Argyll and the Isles, Bro. Kenneth Johnson and his Commissioned Office-bearers. 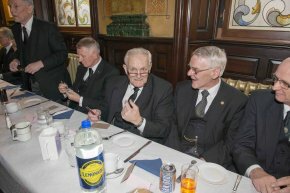 On completion of the ceremony, the Brethren retired to the Royal Hotel for a celebration Dinner speeches and toasts. On 29 September, IPPGM Bro. Archie Chalmers, Bro. Iain Gemmell and Bro. Stewart Cruickshank joined a Deputation from PGL Glasgow, headed by SPGM Bro. 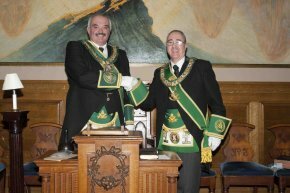 Gavin Stewart into Lodge Clyde No.408. RWM Bro. William McLaughlin welcomed the Deputation. This was a meeting of The Fifth Friday Club. IPPGM Bro. Archie Chalmers had been invited to deliver his talk on Sir Alexander Fleming. 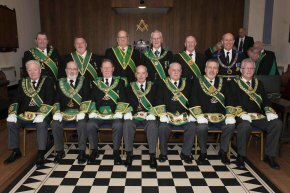 In addition to the Brethren from the Fifth Friday Club several other Lodges were represented as well as the Deputation from PGL Glasgow. On 15 September, RWPGM Bro. 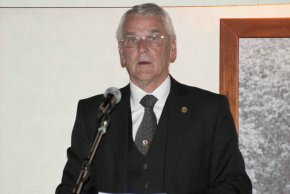 Robert Little headed a Deputation from PGLA into the half yearly Communication and Installation of Elective Office-bearers of the Provincial Grand Lodge of Galloway. RWPGM Bro. Robert Little also headed the Deputation from the Sister Provinces. RWPGM Bro. 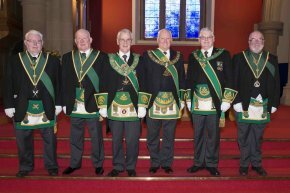 John Henderson extended a warm welcome to the Deputation from the Sister Provinces and after the business was completed, the Depute Provincial Grand Master, Provincial Grand Secretary and Provincial Grand Chaplain installed the elective Office-bearers. RWPGM Bro. 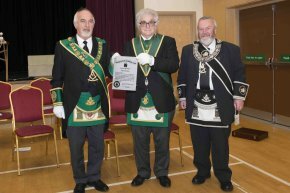 John Henderson then presented the retiring Provincial Grand Senior Warden with his certificate and then conferred Honorary Membership of the Province on Bro. James Seignor McClelland, of Somerset Table Lodge No.9075 EC. The brethren then sent a pleasant time in harmony. On 10 September the Installation of Bro. 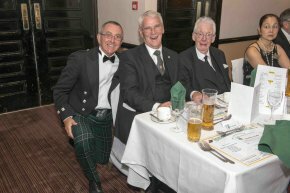 William Perry as Right Worshipful Provincial Grand Master of Lanarkshire Middle Ward and his Commissioned Office-bearers took place at Hamilton College with the meal and Toasts taking place at Hamilton Racecourse. IPPGM Bro. Thomas Davidson welcomed Deputations of Reigning Masters, the visiting Sister Provincial Grand Lodges, headed by RWPGM Bro. 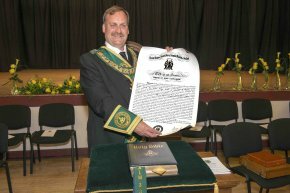 Alistair Marshall of the Province of Stirlingshire and The Grand Lodge of Scotland headed by The Most Worshipful Grand Master Mason. The Most Worshipful Grand Master Mason Bro. 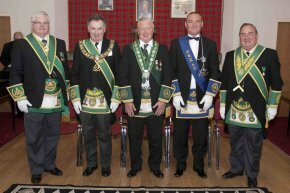 Charles Iain Robert Wolrige Gordon of Esslemont, installed Bro. 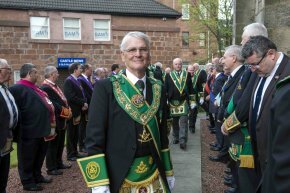 William Perry as RWPGM of Lanarkshire Middle Ward. Substitute Grand Master Bro. 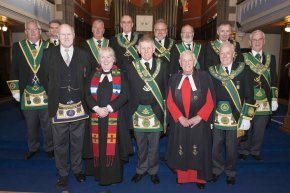 George Kelly then installed the Depute Provincial Grand Master, the four Substitute Provincial Grand Masters, Provincial Grand Secretary and two Provincial Grand Chaplains. On completion of the Installation, Right Worshipful Depute Grand Master Bro. 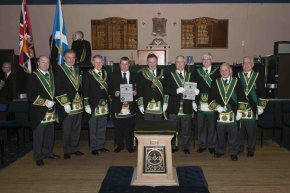 Ramsay McGhee carried out the re-dedication of the Provincial Grand Lodge of Lanark Middle Ward. Grand Director of Ceremonies Bro. William H. Gauld assisted with both ceremonies. 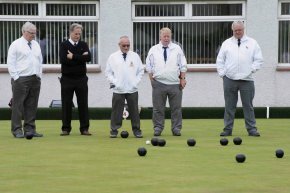 The Annual Grand Lodge Bowing competition was held at Kirkliston Bowling Club on 1 September and was arranged by PPGM’s Bro. Brian Kerley and Bro. Barry Nutley from PGL Midlothian. After the competition Past Depute Grand Master Bro. 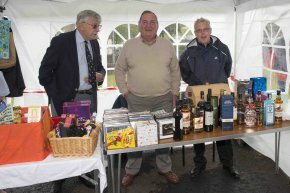 Hugh Bryson supplied and presented the prizes, first to the winners, Bros. Charlie Thorburn, Jim Gray, Colin Arthur and skip Tom Gair and then to the runners up Bros. Hugh Bryson, D Aitchison, James Sturgeon and skip Robert Jess. On 16 August RWPGM Bro. 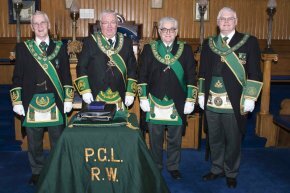 Robert Little headed a Deputation from PGLA into the Provincial Grand Lodge of Kilwinning where RWPGM Bro. T. Wilson Aitken extended a warm welcome to the Deputation of 11 Sister Provincial Grand Lodges. The Deputation was headed by RWPGM Bro. William Perry PGL Lanarkshire Middle Ward. On completion of the business Bro. David Vennard RWM Glasgow Kilwinning No.4 gave a talk on poet Robert Service. On 25 June, RWPGM Bro. 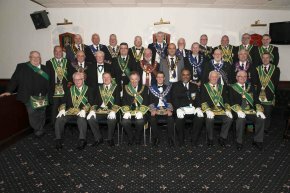 Robert Little, accompanied by Brethren from PGLA, attended the Installation of Bro. 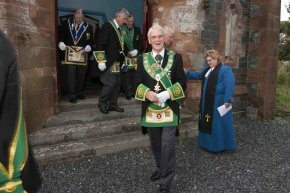 Robert Cattanach as Right Worshipful Provincial Grand Master of the Province of Ross and Cromarty. The ceremony was held in the Duthae Centre, Tain. 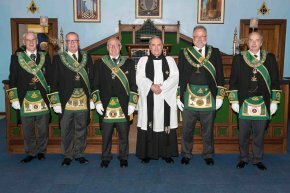 The Installation of RWPGM Robert Cattanach and his Commissioned Office-bearers was carried out by the Most Worshipful Grand Master Mason Bro. 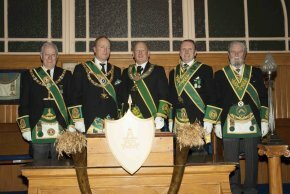 Charles Iain Robert Wolrige Gordon of Esslemont and his Office-bearers including Grand Director of Ceremonies Bro. William H Gauld. 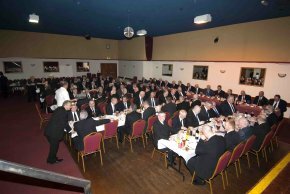 Following the Installation an enjoyable meal was served in the Duthae Centre with the normal toasts being observed. On Sunday 12 June 2016 RWPGM Bro. Robert Little, IPPGM Bro. Archie Chalmers, SPGMs Bro. Jim Bell, Bro. Robert Stewart, Bro. 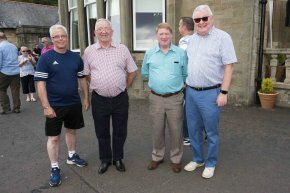 Stephen McConnachie and Bro Stewart Cruickshank all attended the Annual BBQ held at Marcus Humphrey House. This year celebrates the 25th Anniversary of MHH coming into being. 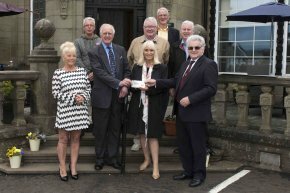 Numerous donations were presented to the House on the day including a cheque for £200 from Lodge Ayr St Paul No.204. 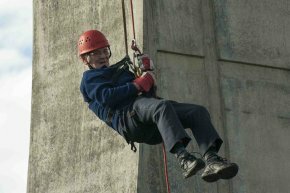 A marvellous day of fun and friendship which was enhanced by the presence of Bro J M Marcus Humphrey of Dinnet, Past Grand Master. To celebrate the 25th Anniversary of Marcus Humphrey House, RWPGM Bro. John Miller and IPPGM Bro. 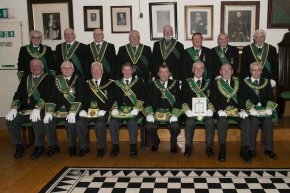 David Reid organised a 1st degree to be conferred on one candidate by the Reigning Provincial Grand Masters of the Provinces involved in the Friends of Marcus Humphrey House. The meeting and dinner was held in the premises of The Prince of Wales No.426 with RWM bro. Ronald Alexander in the chair. RWM Bro. 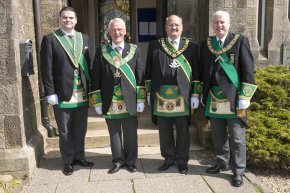 Ronald Alexander welcomed a Deputation from the Provincial Grand Lodge of Renfrewshire East and Sister Provincial Grand Lodges, headed by Depute Provincial Grand Master of Renfrewshire East, Bro. Neil Fraser. RWM Bro. Ronald Alexander welcomed a Deputation of Reigning Provincial Grand Masters headed by RWPGM Bro. 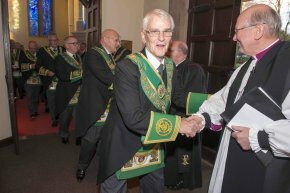 John Miller, this was followed by a Deputation From Grand Lodge headed by Right Worshipful Substitute Grand Master Bro. George Kelly. Right Worshipful Past Grand Master Mason Bro. Marcus Humphrey of Dinnet was also in attendance. After the degree, a celebration dinner was held, followed by Toasts. The Provinces involved were Argyll and the Isles, Ayrshire, Dumfriesshire, Dunbartonshire, Galloway, Glasgow, Kilwinning, Lanarkshire Middle Ward, Lanarkshire Upper Ward, Renfrewshire East and Renfrewshire West. On 27 May, RWPGM Bro. Robert Little, IPPGM Bro. Archibald Chalmers accompanied by Mrs Sadie Chalmers, Bro. Tom Smith PM 331 accompanied by Mrs Sandra Smith and Bro. 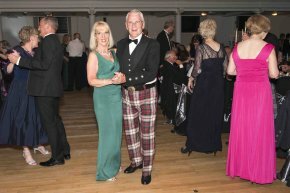 Stewart Cruickshank attended the Annual Gala Ball hosted by the Provincial Grand Lodge of Renfrewshire West. RWPGM Bro. James Livingstone welcomed all to the Town Hall in Greenock. After an enjoyable meal, the entertainment was provided by the Capitol Big Band, with the dance floor full for most of the evening. On 15 June RWPGM Bro. 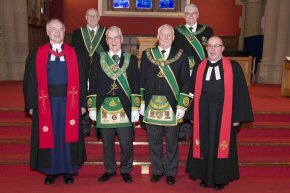 Robert Little headed a Deputation from the Provincial Grand Lodge of Ayrshire to the Annual Divine Service of the Provincial Grand Lodge of Lanarkshire Upper Ward held in Forth Parish Church. RWPGM Bro. Alexander Thomson welcomed the visitors from the Sister Provinces. The service was conducted by the Rev.David Easton. On 8 May, SPGM bro. Stephen McConnachie and Bro. 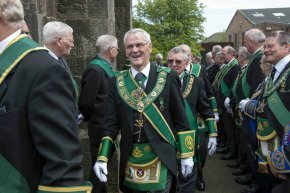 Stewart Cruickshank attended the Divine Service of the Provincial Grand Lodge of Renfrewshire East, held in Stow Brae Kirk, Paisley. The service was conducted by Provincial Grand Chaplains Bro. Rev. Robert Craig and Bro. Rev. Iain Ramsden. RWPGM Bro. 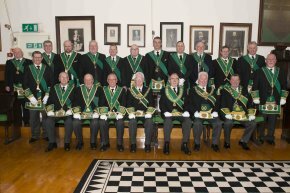 Robert Little, accompanied by a number of Ayrshire Brethren attended the Installation of Bro. 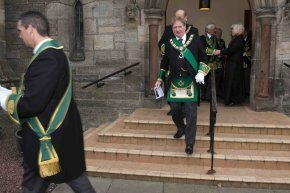 Ronald Fowler as Right Worshipful Provincial Grand Master of the Province of Moray and Nairn on 30 April. 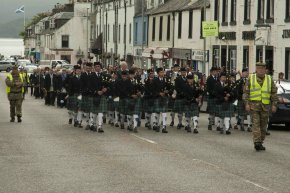 The ceremony was held in the Town Hall, Forres. 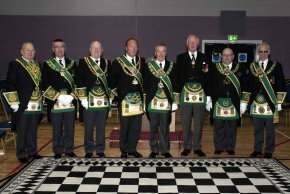 The Installation of RWPGM Bro. 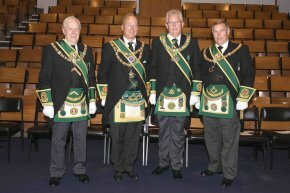 Ronald Fowler and his Commissioned Office-bearers was carried out by the Most Worshipful Grand Master Mason Bro. 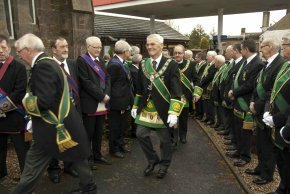 Charles Iain Robert Wolrige Gordon of Esslemont and his Office-Bearers under direction of Grand Director of Ceremonies Bro. William H. Gauld. Grand Treasurer Bro. James Bell attended in his Grand Lodge capacity. Following the Installation an enjoyable meal was served in the Mosset Tavern with the normal toasts being observed. On the evening of 24 April, RWPGM Bro. Robert Little, and Bro. 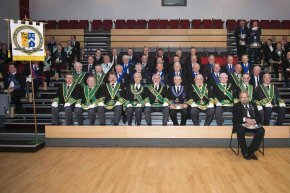 Stewart Cruickshank attended the Annual Divine Service of the Provincial Grand Lodge of Lanarkshire Middle Ward. The service was conducted by Rev. Fiona McKibbin and Senior Provincial Grand Chaplain Bro. Rev. Peter Price in Uddingston Old Parish Church. RWPGM Bro. Thomas Davidson extended a warm welcome to all. On 22 April, RWPGM Bro. 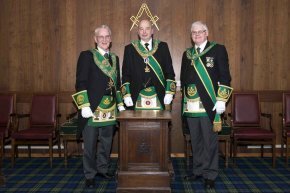 Robert Little accompanied by Bros. George Reid and Stewart Cruickshank, attended the Provincial Grand Lodge of Renfrewshire East Education Dinner. RWPGM Bro. John Miller extended a warm welcome to all present. 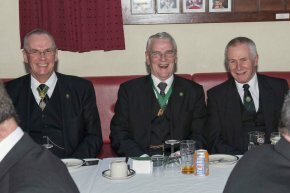 The dinner was held in the premises of Lodge Prince of Wales Renfrew No. 426. The main speaker for the evening was Bro. Robert Cooper, Curator of the Grand Lodge of Scotland Museum and Library. IPPGM Bro. Archie Chalmers, accompanied by Bro J.S. 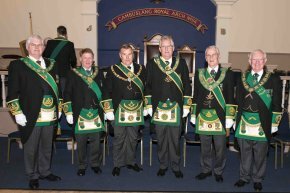 Cruickshank, attended Lodge Callendar No.588 on Monday 18 April 2016. The main purpose was to be present at the Memorial Service for the late Bro. David D. Laing, PM 588, PPGM of PGL Stirlingshire. Afterwards the RWM, Bro. William Davidson, vacated the Chair to allow the PMs of the Lodge to confer the MM Degree. 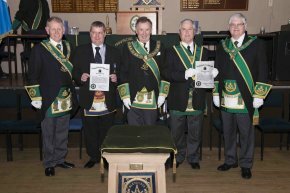 Four brethren were also presented with 50 Year Membership Diplomas. RWPGM Bro. Alistair T. Marshall welcomed everyone present into the Province. On 15 April, IPPGM Bro. Archibald Chalmers and Bro. 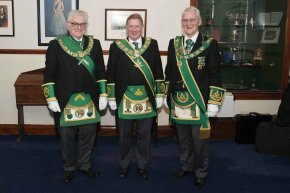 Stewart Cruickshank join a Deputation from PGL Linlithgowshire, headed by RWPGM Bro. Jim Ellis, into Lodge Pioneer No. 1305. RWM Bro. Philip Crozier extended a warm welcome to the Deputation. On completion of the Lodge business, IPPGM Bro. Archibald Chalmers delivered a presentation on the formation of the Victoria Cross. After the presentation RWPGM Jim Ellis conducted the business of the annual visit by the Provincial Grand Lodge of Linlithgowshire. RWPGM Bro. 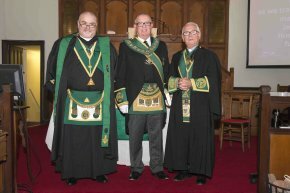 Robert Little accompanied by Bros. Stewart Cruickshank and George Reid attended the Installation of Bro. 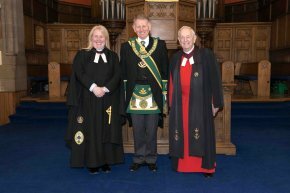 Douglas Fergie as Tight Worshipful Provincial Grand Master of the Province of East Lothian and Berwickshire on 2 April. The ceremony was held in the premises of Lodge Nisbet No.1112, the Mother Lodge of Bro. Fergie. 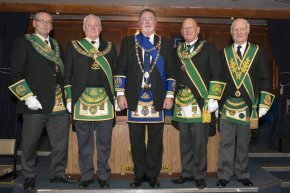 The Installation of RWPGM Bro. 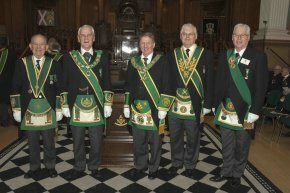 Douglas Fergie and his Commissioned Office-bearers was carried out by the Most Worshipful Grand Master Mason Bro. 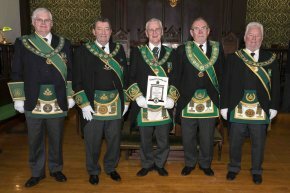 Charles Iain R. Wolrige Gordon of Esslemont and his Office-bearers led by Grand Director of Ceremonies, Bro. William H Gauld. This is the first time that a Deputation from PGLA had visited the PGL of East Lothian and Berwickshire. 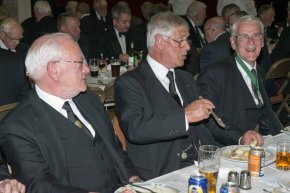 Following the Installation an enjoyable meal was served in the function suite with the normal toasts being observed. On 6 March, RWPGM Bro. Robert Little, IPPGM Bro. Archibald Chalmers and Bro. 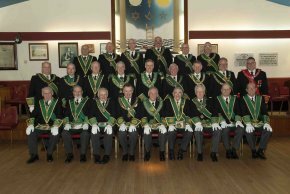 Stewart Cruickshank attended the Provincial Grand Lodge of Stirlingshire Annual Divine Service. The Service was conducted by Rev. Bro. Colin Mailer, Past Provincial Grand Junior Chaplain, in the Denny Old Parish Church. RWPGM Bro. Alistair Marshal extended a warm welcome to all. Lodge St Andrew No.176 provided the refreshment. 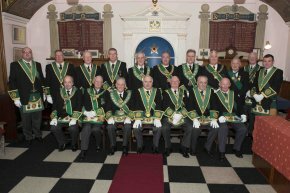 On 4 March 2016 the RWPGM Bro. 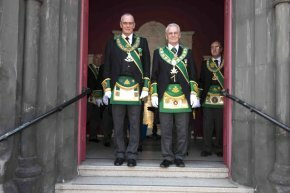 Robert Little, accompanied by IPPGM Bro. Archie Chalmers, DPGM Bro. William Steel and Bro. Stewart Cruickshank PGL Sword-bearer, attended the Annual Communication of the PGL of Lanarkshire Middle Ward which was presided over by RWPGM Bro. Tom Davidson. The Office-bearers were Installed by the RWPGM and DPGM Bro. Bill Perry assisted by PSPGM Bro. Alex Russell. In appreciation of the valuable service rendered to PGL over the past ten years, the RWPGM conferred Honorary Membership of the PGL upon Bro. J. Stewart Cruickshank,a well deserved honour for his diligence and generosity over these past years. 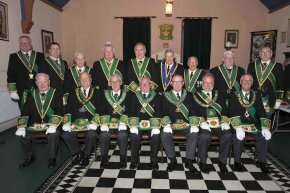 Not surprisingly there were photographs taken at the close of the meeting thereafter all present enjoyed a meal provided by the host PGL. On 27 February, RWPGM Bro. Robert Little and Bro. 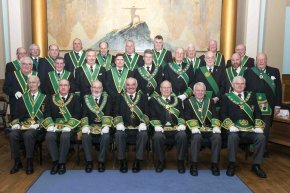 Stewart Cruickshank attended the Annual Meeting of the Provincial Grand Lodge of Stirlingshire where they were part of the Deputation of Sister Provincial Grand Lodges headed by RWPGM Bro. 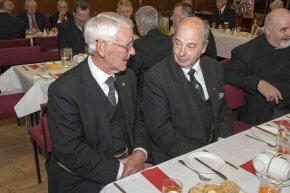 Ronnie Forbes RWPGM of Perthshire East and welcomed by RWPGM Bro. Alistair Marshal. The Installation of Elective Office-bearers was carried out by RWPGM Bro. Alistair Marshal. After the meeting a meal was enjoyed by all who stayed. On 26 February RWPGM Bro. Robert Little, IPPGM Bro. Archibald Chalmers and Bro. 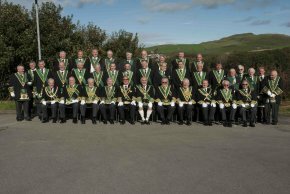 Stewart Cruickshank attended the Annual Meeting of the Provincial Grand Lodge of Dumfriesshire as part of the Deputation of Sister Provincial Grand Lodges headed by RWPGM Bro. 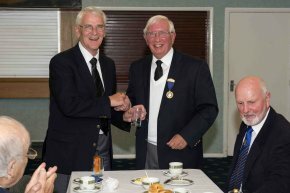 Tom Davidson and welcomed by RWPGM Bro. Robert Hughes. 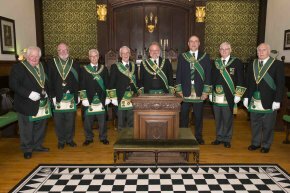 The Installation of Elective Office-bearers was carried out by Provincial Grand Secretary Bro. 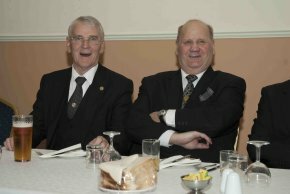 Hugh Norman and Provincial Grand Treasurer Bro. Sinclair Graham. After the meeting a meal was enjoyed by all who stayed. On 16 February, RWPGM Bro. 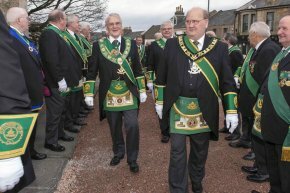 Robert Little headed a Deputation from PGLA as part of a Deputation from Sister Provinces into the Provincial Grand Lodge of Kilwinning. The deputation from Sister Provinces was headed by RWPGM Bro. John Henderson from PGL Galloway and the Deputation was welcomed by RWPGM Bro. T. Wilson Aitken. After completing the business, RWPGM Bro. 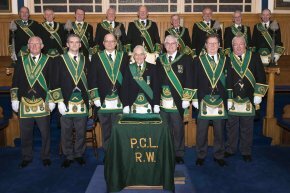 T. Wilson Aitken installed the Elective Office-bearers of PGL Kilwinning. On Friday 5 February 2016 RWPGM Bro. 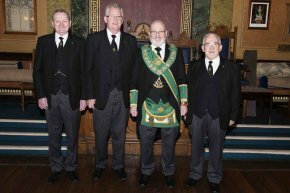 Robert Little, accompanied by IPPGM Archie Chalmers, PG Sword-bearer J Stewart Cruickshank and PG President of Stewards Liam Stewart, attended the Annual Communication of the PGL of Renfrewshire West, Bro. J P. Livingston RWPGM presiding. 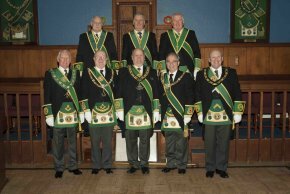 The Visiting Deputations were headed by RWPGM of Glasgow Bro. James C Peddie. 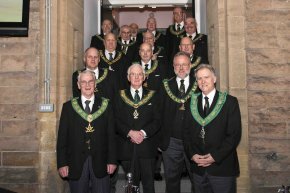 The Office-bearers of the PGL were installed by PG Secretary Bro Robin McIntyre. 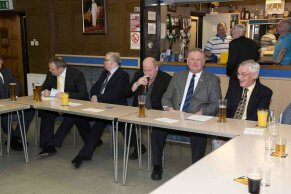 After the Communication the brethren dined in the upstairs hall where The Citizen of the Year Award was presented by RWPGM Bro. Livingston to Mrs Elizabeth McDonald Project Manager of “Hammies, Out of School Care” in Port Glasgow. The PGL also donated £250 to this very worthwhile project. Another enjoyable evening amongst our Sister Province. On 20 December, RWPGM Bro. Robert Little and IPPGM Bro. 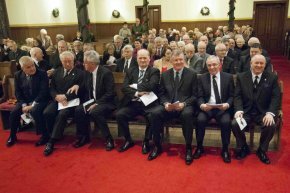 Archie Chalmers attended the Carol Service hosted by the Provincial Grand Lodge of Renfrewshire East. 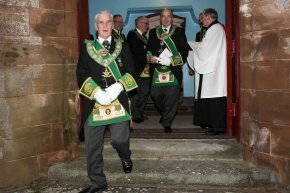 The Service was conducted in Stow Brae Kirk, Paisley and conducted by Bro. Revd. Robert Craig and Bro. Revd. Iain Ramsden. On 13 December RWPGM Bro. Robert Little and IPPGM Bro. 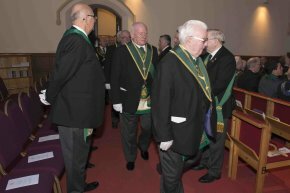 Archibald Chalmers attended the Christmas Carol Service of the Lanarkshire Masons held in St. Andrews Parish Church, Baillieston. 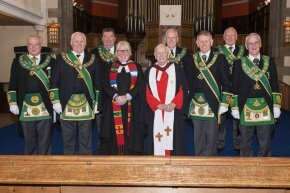 Representatives from the various Masonic Orders within Lanarkshire gave readings during the service which was conducted by the Revd. Malcolm Cuthbertson. 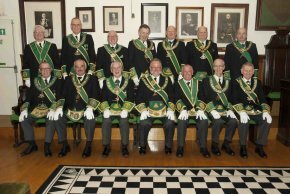 On Thursday 26 November 2015 the MWGMM Bro. 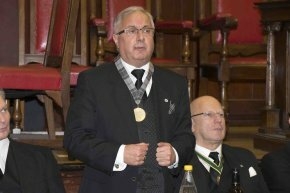 Charles Ian Robert Wolrige Gordon of Esslemont, was Installed for the 8th time as the Head of Scottish Freemasonry. 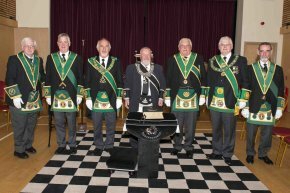 The Installation of the Office-bearers was conducted by Depute Grand Master Bro. Ramsay McGhee and Substitute Grand Master Bro. George Kelly. This included Ayrshire members Bro. James Bell as Grand Treasurer; Bro. Sam Peden as Grand Bard and Bro. Archie Chalmers as Senior Grand Standard-bearer. 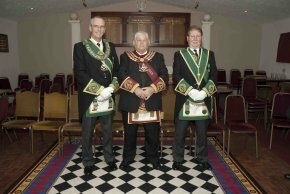 At the conclusion of the Installation, Grand Secretary intimated that Bro. Derek Welch PM No.86, had been granted Honorary Grand Rank of Jeweller; Bro. Robert Cramb PM No.169, had been granted Honorary Grand Rank of Assistant Grand Secretary and Bro. Iain Gemmill PM No.125, had been granted Honorary Grand Rank of Senior Grand Standard-bearer. 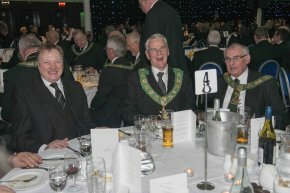 Thereafter the brethren adjourned to the Edinburgh Corn Exchange to celebrate the Festival of St Andrew. On 1 November, RWPGM Bro. Robert Little, IPPGM Bro. Archibald Chalmers, Bro. Iain Gemmell, Bro. John O'Neil and Bro. 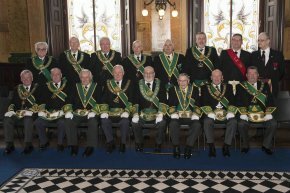 Stewart Cruickshank attended the Annual Divine Service of the Provincial Grand Lodge of Glasgow. The Service held in Sherbrooke St. Gilbert’s Church, was conducted by Bro. Rev. Gordon B. Armstrong Past Senior Grand Chaplain, Past Substitute Grand Master and Rev. Thomas L. Pollock, Minister of Sherbrooke St. Gilbert’s Church. RWPGM Bro. James Peddie extended a warm welcome to all present. On 25 October RWPGM Bro. 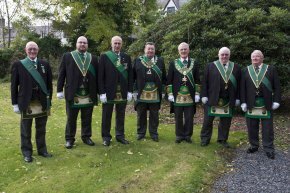 Robert Little headed a Deputation to the Provincial Grand Lodge of Galloway Divine Service held in Glenluce. The Service was conducted by Rev. Fiona Wilson. After the service a dinner was served in the local Golf Club. On 26 September RWPGM Bro. 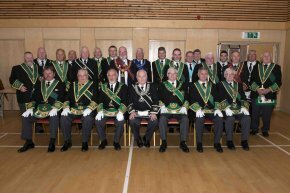 Robert Little headed a Deputation from the Provincial Grand Lodge of Ayrshire to the 275th Anniversary Celebrations of the Provincial Grand Lodge of Argyll and the Isles held in the Argyllshire Gathering Halls, Oban. RWPGM Bro. Kenneth Johnson welcomed the Deputation of visiting Sister Provinces headed by RWPGM Bro. Robert Little. 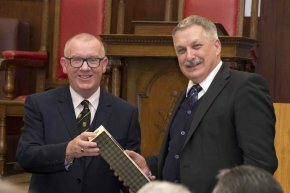 A Deputation from the Grand Lodge of Scotland, headed by The Most Worshipful Grand Master Mason, Bro Charles Iain Robert Wolrige Gordon of Esslemont, was welcomed and after accepting the emblem of power and authority conducted the Rededication Ceremony with Acting Grand Chaplain, Bro. Andrew Paterson and Grand Director of Ceremonies, Bro. William Gauld. IPPGM Bro. Archibald Chalmers and SPGM Bro. 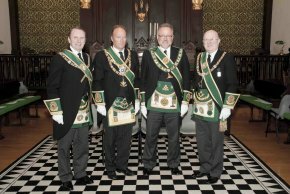 James Bell were included in the Grand Lodge Deputation. 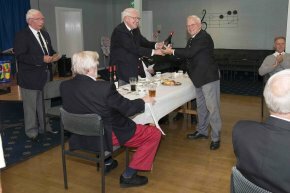 After the ceremony and an enjoyable meal the usual toasts were observed including RWPGM Bro. Robert Little who proposed the toast to the Province. 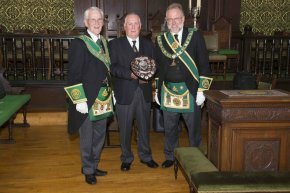 Prior to the meeting, The MWGMM presented the Grand Lodge of Scotland Autumn Golf Trophy to RWPGM Bro. Robert Little. The competition was held at Auchterarder in the Province of Perthshire East. 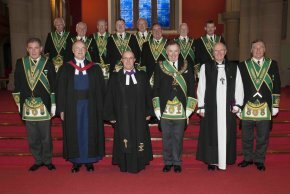 On 23 September, IPPGM of the Province of Glasgow, Bro. Alistair Henderson headed a Deputation from the Province, into Lodge Clydesdale Glasgow No.556 where RWM Bro. James Hamilton extended a warm welcome. IPPGM Bro. Archibald Chalmers and Bro. 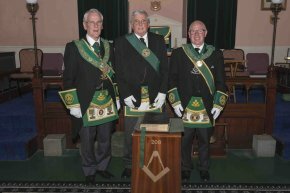 Stewart Cruickshank joined the Deputation at the invitation of Bro. Henderson. The purpose of the visitation was to enable Bro. Henderson to present Bro. Donald Riddell PM with a 50 year Jubilee Certificate. Bro. 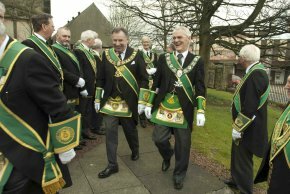 Riddell is a Past Substitute Provincial Grand Master and Honorary Provincial Depute Grand Master of the Province of Glasgow. On Saturday 19 September 2015 RWPGM Bro. Robert Little and IPPGM Bro. 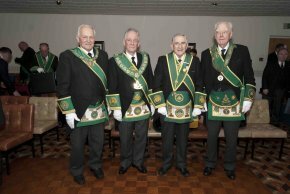 Archie Chalmers were guests of Sir William Wallace Royal Arch Chapter No.109 who meet in Johnstone. 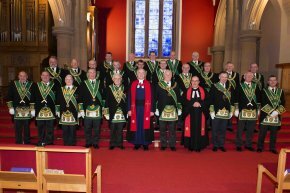 The occasion was the 150th Anniversary of the Chapter with the ceremony being conducted by the First Grand Principal, MEC Ian Fraser, First Principal and Officers of the Supreme Grand Royal Arch Chapter of Scotland. 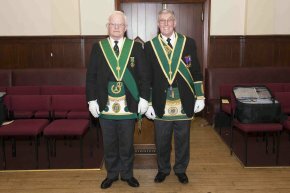 Amongst other Ayrshire Brethren/Companions present were Grand Superintendent of Ayrshire Gordon Booth and Past Grand Superintendent John Mitchell. The First Principal of the host Chapter was MEC Robert Bone Black. A most enjoyable day was had by all. 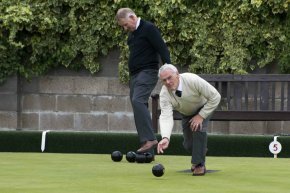 On Thursday 3 September 2015 the Annual Bowling Competition of the Grand Lodge of Scotland took place at Kirkliston Bowling Club. Two full rinks participated in another very enjoyable day, socially and weather-wise. 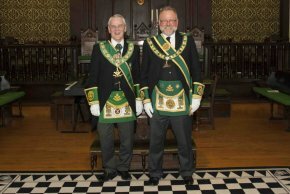 Brother Brian Kerley and Brother Barry Nutley, both PPGM’s of Midlothian arrange the day and their efforts were more than satisfactory. The buffet afterwards was of an equally high standard. 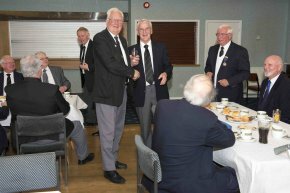 Whilst one of the Rinks, with the highest score, were presented with small gifts, as were the Runners-up, (this year kindly provided by our PGM Bro. Robert Little) everyone was a winner. 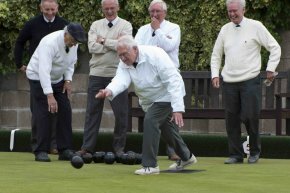 Anyone interested in a friendly social day of bowls next year will be made welcome. Either contact PGM Bro. Robert Little of IPPGM Archie Chalmers. RWPGM Bro. 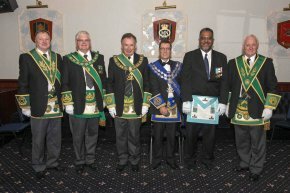 Robert Little attended the Installation of Bro. 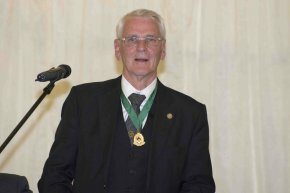 Michael Egan Mulholland as RWPGM of the Province of Forfarshire on 22 August. 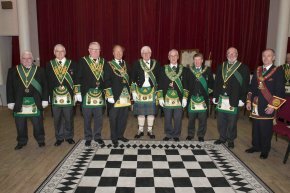 The Installation of the RWPGM and his Commissioned Office-bearers was conducted by The Most Worshipful Grand Master Mason Bro. Charles I.R. Wolrige Gordon of Esslemont, Grand Director of Ceremonies Bro. 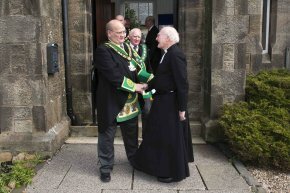 William Gauld and Grand Chaplain Bro. Rev Robert Craig. 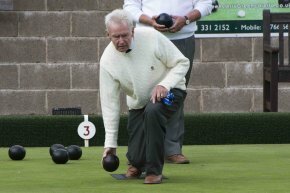 The ceremony and celebration dinner took place in the Dundee Indoor Bowling Club. As well as the PGM, Bro. 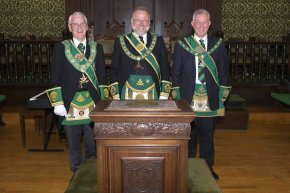 Stewart Cruickshank represented the Provincial Grand Lodge of Ayrshire, with Bros. Archibald Chalmers and Samuel Peden representing Grand Lodge. On 18 August RWPGM Bro. 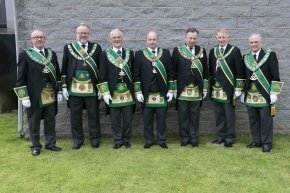 Robert Little and a Deputation from PGLA, attended the summer Communication of the Provincial Grand Lodge of Kilwinning. RWPGM Bro. T. Wilson Aitken welcomed the Deputation from the Sister Provinces which, in addition to Ayrshire, included Argyll and the Isles; Dumfriesshire; Dunbartonshire; Galloway; Glasgow; Lanarkshire Middle Ward; Lanarkshire Upper Ward; Perthshire East; Perthshire West; Renfrewshire East; Renfrewshire West and Stirlingshire. After the business was completed, Bro. Terry Stoddard gave talk, written by Bro. 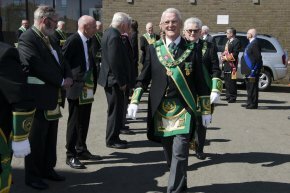 Steve Foster on the relative merits of the claims to antiquity by the Lodge Mother Kilwinning, The Lodge of Edinburgh (Mary’s Chapel) No.1 and Lodge Glasgow St John No.3bis. On 1 August, RWPGM Bro. Robert Little attended the Installation of Bro. 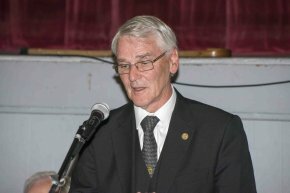 John Blackie as RWPGM of the Province of Roxburgh, Peebles and Selkirk Shires. 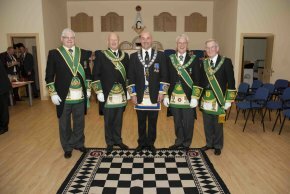 The Installation of the RWPGM and his Commissioned Office-bearers was conducted by The Most Worshipful Grand Master Mason Bro. Charles I.R. Wolrige Gordon of Esslemont, Grand Director of Ceremonies Bro. William Gauld and Grand Chaplain Bro. Rev Robert Craig. The ceremony celebration dinner took place in the Volunteer Hall, Galashiels. As well as the PGM, Bro. 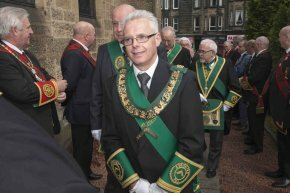 Stewart Cruickshank represented the Provincial Grand Lodge of Ayrshire. On Sunday 26 July, RWPGM Bro. Robert Little and Bro. 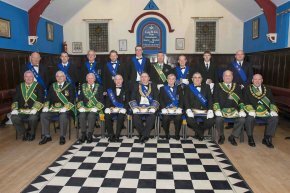 Stewart Cruickshank attended the Annual Divine Service of Lodge Eskdale Kilwinning No. 107. 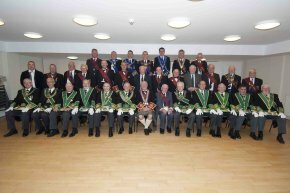 RWM Alexander Maxwell welcomed all Brethren. 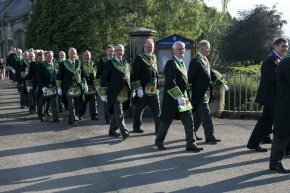 Prior to the service, all present paraded from the Lodge to Langholm Parish Church where Rev. Scott McCarthy conducted an excellent service. 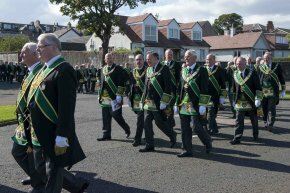 The parade then returned to the Lodge. The local Brass Band provided the marching music. On Sunday 21 June, the Annual BBQ was held at Marcus Humphrey House. As well as the now customary attendance of Brother Marcus Humphrey, Past Grand Master, the brethren were delighted with the attendance of the Most Worshipful Grand Master Mason and Grand Secretary. 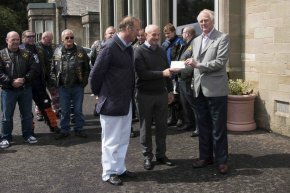 Several cheques were presented to the Home by Lodge Ayr St Paul No.204, the Widows Sons (Motorcycle Group), Lodge St Michael No.989 and Lodge St Thomas No.306 for which Brother Marcus Humphrey expressed grateful thanks for the generosity of the brethren and Lodges concerned. 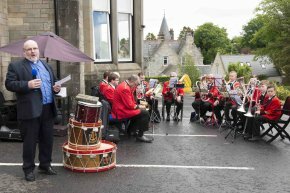 The Drum Head Service was once again led by Provincial Grand Chaplain Brother Rev Robert Craig with a local brass band from Inverclyde providing the musical accompany. 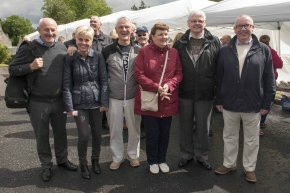 The customary stalls were available to help raise funds for the Home. 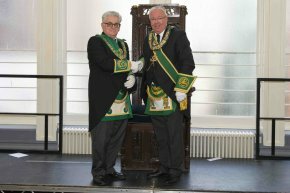 The Provinces are indeed grateful to Brother David A. Reid, IPPGM of Renfrewshire East for his continued Chairmanship of the MHH Group. RWPGM Bro. Robert Little attended the Installation of Bro. 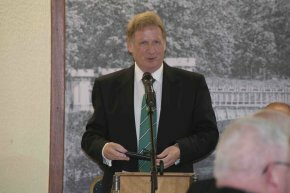 Alistair Marshall as RWPGM of the Province of Stirlingshire on 20 June. Other members representing PGLA were Bros. Robert McCroskie, Stewart Cruickshank, Iain Gemmell and Duncan Stanners. 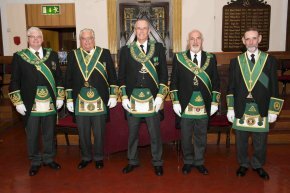 The Installation of the RWPGM and his Commissioned Office-bearers was conducted by The Most Worshipful Grand Master Mason Bro. Charles I.R. Wolrige Gordon of Esslemont, Grand Director of Ceremonies Bro. William Gauld and Grand Chaplain Bro. Rev. Robert Craig. 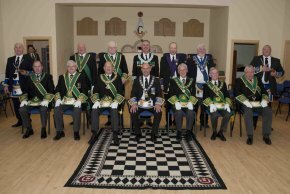 The ceremony took place in premises of Lodge Zetland No. 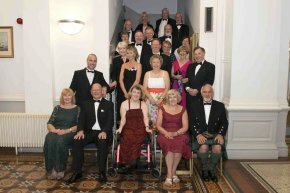 391 with the celebration dinner and speeches in the Grangemouth Town Hall. RWPGM Bro. 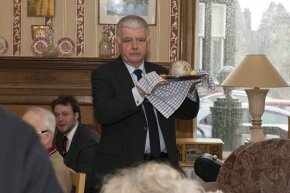 Robert Little replied to the Toast to the Sister Provincial Grand Lodges. On Friday 29 May 2015 RWPGM Bro. 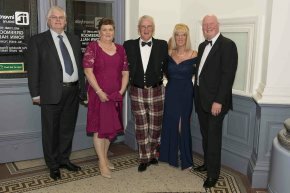 Robert Little, accompanied by several others from Ayrshire, attended the PGL of Renfrewshire West Summer Ball held within the magnificent Greenock Town Hall. RWPGM Bro. James P. Livingston welcomed all present with particular mention of the presence of the MWGMM Bro. Charles I. R. Wolrige Gordon of Esslemont and Grand Secretary accompanied by Mrs. Begg. After a most enjoyable meal there followed a dance to The Capitol Big Band. 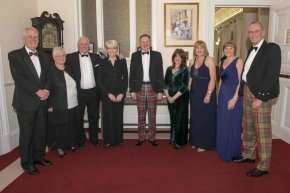 As a result of an excellent attendance, who were all very supportive of the charitable cause of the event, the PGM was pleased to announce that the evening had raised £3,570 for Charity. For a Province of only 9 Lodges this was a marvellous effort. On 18 May IPPGM Bro. Archibald Chalmers and Bro. 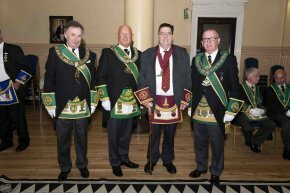 Stewart Cruickshank joined a Deputation from the Provincial Grand Lodge of Glasgow headed by SPGM Bro. 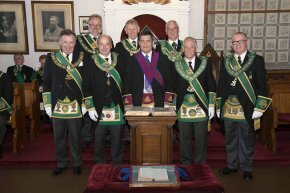 Allan Jenkins on a visit to Lodge Concord No.1341. RWM Bro. Ian Parker extended a warm welcome to the Deputation. SPGM Bro. 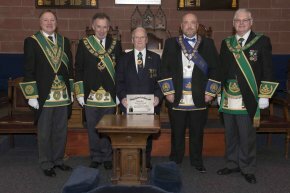 Allan Jones presented a 50 year diploma to Bro. Neil McGregor PM . 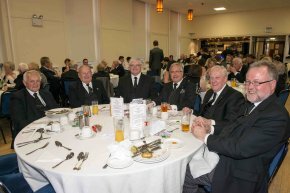 This was Lodge Concord’s annual fish supper night and a good harmony was enjoyed by all. On 17 May, SPGM Bro. Robert Stewart, Bro. Liam Stewart and Bro. 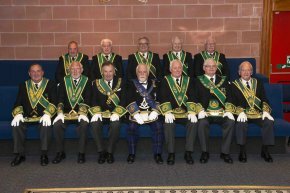 Stewart Cruickshank attended the Annual Divine Service of the Provincial Grand Lodge of Lanarkshire Upper Ward. RWPGM Bro. Alexander Thomson extended a warm welcome to all. The Service was conducted by Rev. David Easton in Forth St. Paul's Parish Church. On 16 May IPPGM Bro. Archibald Chalmers, Bro. Iain Gemmell and Bro. 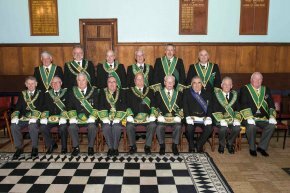 Stewart Cruickshank attended the Rededication Ceremony of Lodge St. Molios No.774 celebrating their 125th Anniversary. 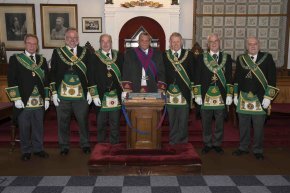 The ceremony was conducted by the Provincial Grand Lodge of Argyll and the Isles headed by RWPGM Bro. Kenneth Johnson. On 15 May, IPPGM Bro. Archibald Chalmers, SPGM bro. Stephen McConnachie and Bro. 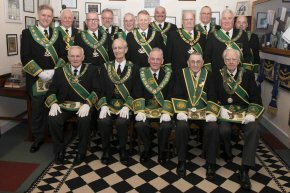 Stewart Cruickshank attended the Annual Past Masters' Dinner at Lodge Nethan St. John No.1289. IPPGM Bro. Archie delivered his talk on the Importance of Nothing. SPGM Bro. Stephen McConnachie delivered a talk on Benjamin Franklin. 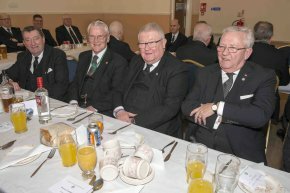 Both talks were enjoyed by the Brethren and then all present also enjoyed a buffet. 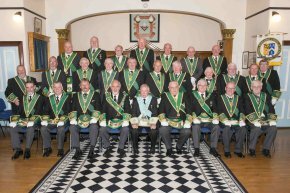 On Thursday 14 May 2015 Brother Iain Gemmill PM Lodge St James Newton-upon-Ayr No.125, completed a tour of every Lodge in Scotland. 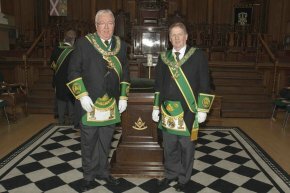 His final visit was to Lodge Stepps No.1213 in the Province of Glasgow. The journey began 4 years and 10 months ago and has obviously covered the 31 Provinces in Scotland with many visits requiring an overnight stay as well as numerous ferry crossings. 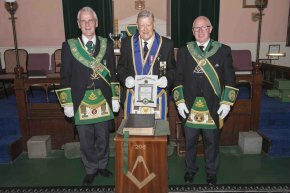 This marvelous achievement was recognised by the RWM Brother Wallace Smith of Lodge Stepps presenting him with a beautiful plaque suitably decorated. 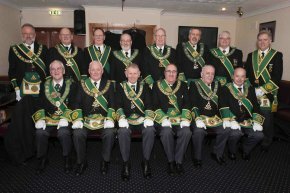 Also present were the RWPGM of Glasgow Brother James C. Peddie, RWPGM of Ayrshire Brother Robert Little, RWPGM of Perthshire West Brother John S. Brockie, and numerous other members of the several PGL’s. 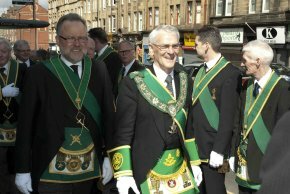 RWM Brother Jim Munro of Lodge St James No.125 was accompanied by a large Deputation from Bro. Iain’s Mother Lodge. The evening was completed by an enjoyable MM Degree conferred by Lodge Anderson McMillan No.1552. On 19 May, RWPGM Bro. 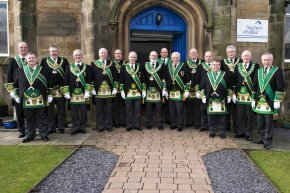 Robert Little attended the Annual Divine Service of the Provincial Grand Lodge of Dunbartonshire. RWPGM Bro. 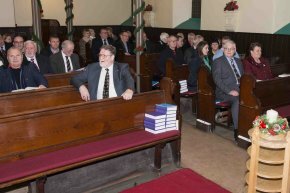 John McCormack welcomed all to the Service in Old Kilpatrick Bowling Church, conducted by Rev. Ishbel Robertson and PG Chaplain Bro. Rev. John K. Clark. On 1t May RWPGM Bro. 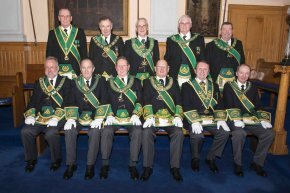 Robert Little headed a Deputation from PGLA, amongst the Deputation from Sister Provincial Grand Lodges into the Provincial Grand Lodge of Lanarkshire Upper Ward for the Annual Installation of Elective Office-bearers. The Deputation was headed by RWPGM Bro. Andrew Paterson PGM of Fife and Kinross. RWPGM Bro. Alexander Thomson extended a warm welcome to all. Depute Provincial Grand Master Bro. Alexander Brown and Substitute Provincial Grand Master Bro. John Drummond carried out the Installation. On the evening of 26 April, RWPGM Bro. Robert Little, IPPGM Bro. Archibald Chalmers and Bro. 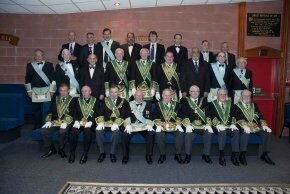 Stewart Cruickshank attended the Annual Divine Service of the Provincial Grand Lodge of Lanarkshire Middle Ward. The service was conducted by Rev. Fiona McKibbin and Senior Provincial Grand Chaplain Bro. Rev. Peter Price in Uddingston Old Parish Church. RWPGM Bro. Thomas Davidson extended a warm welcome to all. On the afternoon of 26 April, RWPGM Bro. Robert Little, Bro. Roddy McLean and Bro. 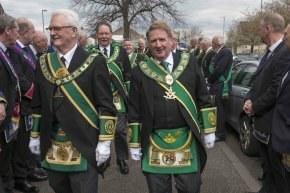 Stewart Cruickshank attended the Annual Divine Service of the Provincial Grand Lodge of Renfrewshire East. The service was conducted by Provincial Grand Chaplains Pastor William Shirlaw and Rev. Robert Craig in The Cathcart Congregational Church. RWPGM Bro.John Miller extended a warm welcome to all. 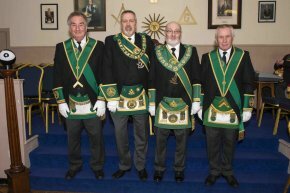 On 9 March IPPGM Archibald Chalmers joined a Deputation from the Provincial Grand Lodge of Glasgow on a visit to Lodge Montefiore No.753, the Provincial Grand Lodge of Kilwinning was also represented. Bro. Colin Grant RWM of 753, welcomed the Deputation into the Lodge and then proceeded to confer Honorary Membership of Lodge Montefiore on IPPGM Bro. Alistair Henderson in recognition of his long service to the Province and the Lodge. Two candidates were then initiated into the Lodge. On 8 March, RWPGM Bro. 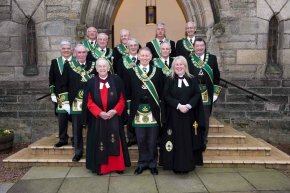 Robert Little and a Deputation from PGLA attended the Divine Service of the Provincial Grand Lodge of Stirlingshire held in Tulliallan and Kincardine Parish Church, Tulliallan. RWPGM Bro. Andrew McKinnon welcome all to the Service which was conducted by Bro. Rev. Alex Shuttleworth MM of Lodge St. James (Kilwinning) Tarbolton No.135. RWPGM Bro. 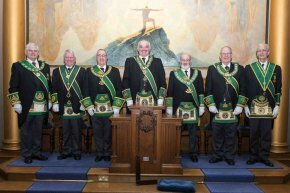 Robert Little headed a Deputation from 15 Sister Provinces into the Provincial Grand Lodge of Lanarkshire Middle Ward on 6 March. RWPGM Bro. 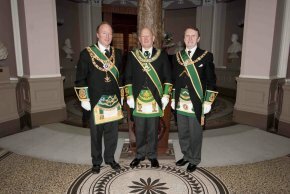 Thomas Davidson welcomed the Deputation and then welcomed a Deputation from The Grand Lodge of Scotland headed by Substitute Grand Master Bro. George Kelly. 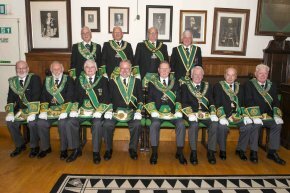 This Deputation consisted of Members of Grand Lodge and of the Province. 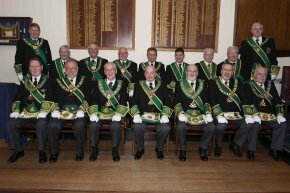 The Installation of Provincial Grand Lodge of Elected Office-bearers then took place. On 28 February, RWPGM Bro. 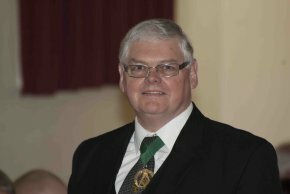 Robert Little headed a Deputation from PGLA to the Annual Installation of Elected Office-bearers at the Provincial Grand Lodge of Stirlingshire.as part of the Deputation from the Sister Provinces. RWPGM Bro. Andrew McKinnon welcomed the Deputation headed by RWPGM Bro. John Brockie Provincial Grand Lodge of Perthshire West. RWPGM Bro. 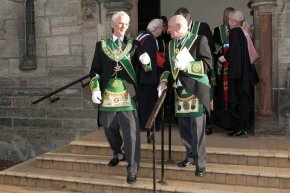 Andrew McKinnon and IPPGM Bro. 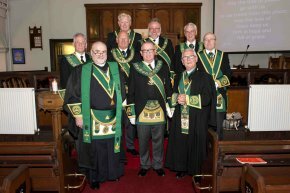 John McKenzie Installed the Office-bearers. On 27 February, RWPGM Bro. 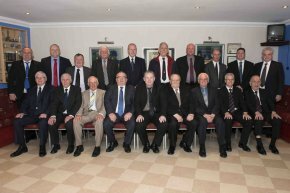 Robert Little headed a small Deputation from PGLA to the Annual Installation of Elected Office-bearers at the Provincial Grand Lodge of Dumfriesshire as part of the Deputation from Sister Provinces. RWPGM Bro. Robert Hughes welcomed the Deputation headed by RWPGM Bro. 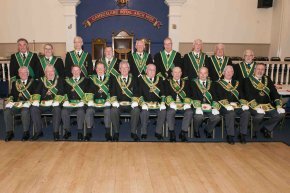 Alexander Thomson Provincial Grand Lodge of Lanarkshire Upper Ward. SPGM Bro. Robert Jess and PGL Chaplain Bro. Robert Plunkett Installed the Office-bearers in a competent and enjoyable manner. 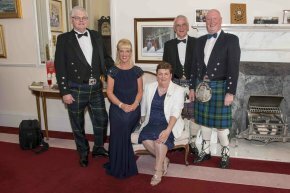 On 22 February the Annual Burns Supper was held at Marcus Humphrey House. This year SPGM Bro. 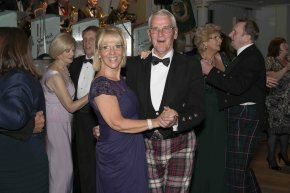 Stephen McConnachie arranged the entertainment on behalf of the Provincial Grand Lodge of Ayrshire. IPPGM Bro. Archibald Chalmers addressed the Haggis, SPGM Bro. 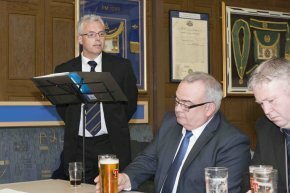 Stephen McConnachie delivered the Immortal Memory with other Brethren giving readings at designated parts of the Immortal Memory. Musical entertainment was provided by Douglas Hunter of Lodge Royal Blues 399. On 21 February RWPGM Bro. 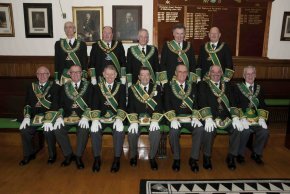 Robert Little attended the Annual Communication and Installation of elected Office-bearers of the Provincial Grand Lodge of Roxburgh, Peebles, & Selkirk Shires held in the the Hawick Lodge Temple. The deputation of Sister Provincial Grand Lodges, headed by RWPGM Bro. 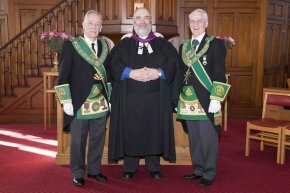 Andrew McKinnon, was welcomed by IPPGM Bro. Allan Marshall. The Installation of elected Office-bearers was carried out by DPGM Bro. 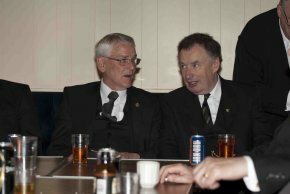 John Blackie and SPGM Bro. Michael Peutrill. 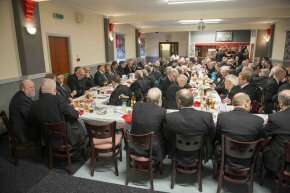 On completion of the meeting, the Brethren enjoyed a meal followed by toasts and replies. 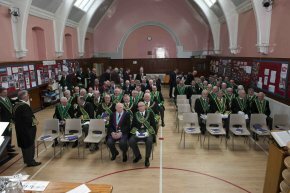 On 17 February, the Provincial Grand Lodge of Kilwinning held their Annual Communication. 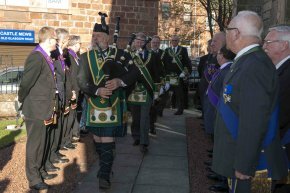 The Provincial Grand Lodge of Kilwinning was opened by RWPGM Bro. T. Wilson Aitken. A Deputation from Sister Provincial Grand Lodges headed by RWPGM Bro. James C. Peddie PGL Glasgow was welcomed in to the Province. IPPGM Bro. 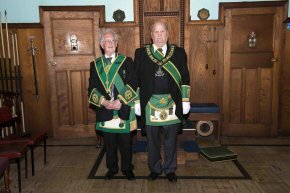 David Bloomfield and PPGM Bro. 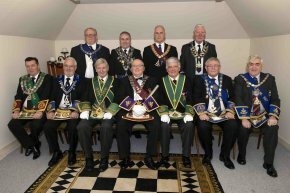 David Wilson installed the elected Provincial Grand Lodge Office-bearers. On 7 February RWPGM Bro. Robert Little, IPPGM Bro. Archibald Chalmers and Bro. 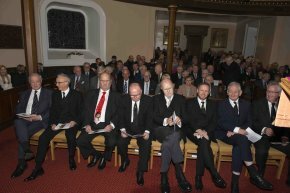 Stewart Cruickshank attended the Bi-Centenary of Lodge Lockerbie Quhytewoollen No.258. RWM Bro. Neil Armstrong welcomed the Deputation from the Provincial Grand Lodge of Dumfriesshire headed by RWPGM Bro. Robert Hughes and then a Deputation from The Grand Lodge of Scotland headed by the Depute Grand Master Mason Bro. Ramsay McGhee. 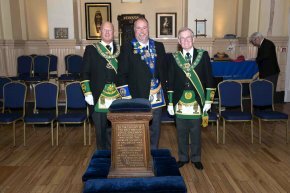 The Ceremony was carried out by the Depute Grand Master Mason Bro. Ramsay McGhee, Grand Director of Ceremonies, Bro. William Gauld and Acting Grand Chaplain Bro. David Reid. On 6 February, RWPGM Bro. Robert Little, IPPGM Bro. Archibald Chalmers, Bro. William McIntosh and Bro. 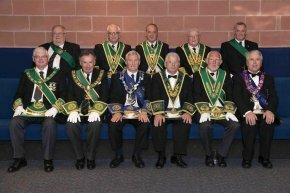 Stewart Cruickshank attended the annual Installation of Elected Office-bearers of the Provincial Grand Lodge of Renfrewshire West. RWPGM Bro. James Livingstone welcomed the Deputations form Sister Provincial Grand Lodges and then DPGM Bro. John Keith installed the Office-bearers. After the meeting, an enjoyable meal was had by all and thereafter RWPGM Bro. James Livingstone presented the PGL Renfrewshire West award of Citizen of the year to Christine McLaughlan for her service to the Girl Guides. 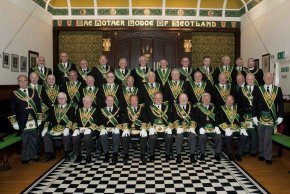 On 2 February, Lodge Montefiore No.753 were visited by the Provincial Grand Lodge of Glasgow for their Annual Visitation. The Provincial Deputation was headed by SPGM Bro. 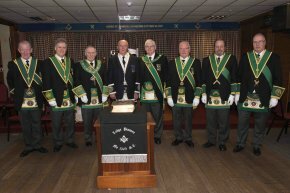 Duncan McIntosh and the deputation was welcomed into the Lodge by RWM Bro. Colin Grant. After a clear minute was granted and the visitation completed, RWM Bro. Colin Grand conferred Honorary Membership of Lodge 753 on Bro. Archibald Chalmers PM Lodge Thistle No. 127 IPPGM PGLA. 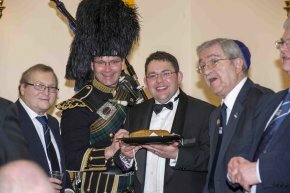 After the meeting the Lodge held a mini Burns Supper. On 31 January, SPGM Bro. 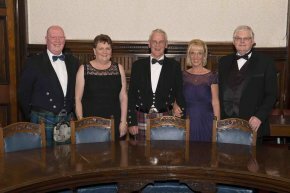 Stephen McConnachie headed a small deputation for PGLA into the Annual Installation of Elected Office-bearers of the Provincial Grand Lodge of Renfrewshire East. Also in the Deputation were IPPGM Bro. Archibald Chalmers, PSPGM Bro. John Taylor, Bro. Iain Gemmell and Bro. Stewart Cruickshank. The Deputation from Sister Provinces was headed by RWPGM Bro. John Henderson of PGL Galloway. RWPGM Bro. 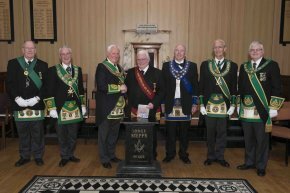 John Miller welcomed the Deputation and then welcomed a Deputation from Grand Lodge of Scotland headed by Right Worshipful Past Depute Grand Master Archibald McGown. The Office Bearers were installed by SPGM Bro. Iain McPhee and SPGM Bro. Robert McPhee. On 9 January, IPPGM Bro. Archibald Chalmers and Bro. 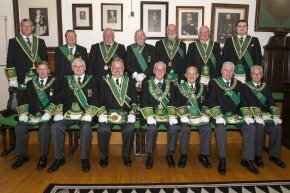 Stewart Cruickshank attended the Annual Installation of Elective Office-bearers of the Provincial Grand Lodge of Perthshire East. The Deputation of Sister Provinces, headed by RWPGM Bro. 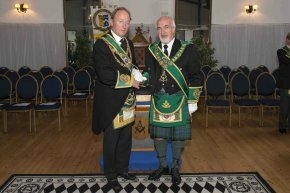 Andrew McKinnon of the Province of Stirlingshire, was welcome into the Province by RWPGM Bro. Ronald Forbes. The Installation was carried out by DPGM Bro. Russell Logan. On 29 December IPPGM Bro. 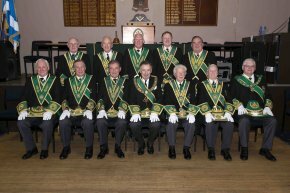 Archibald Chalmers visited Lodge Southern Cross No. 1243 and joined the Deputation from the Provincial Grand Lodge of Glasgow. 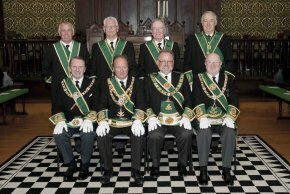 A Second Degree was conferred by Brethren from Edinburgh Lodges. 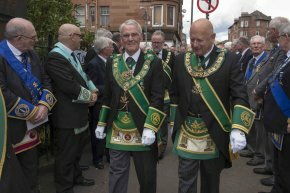 After the degree the RWPGM of Glasgow Bro. 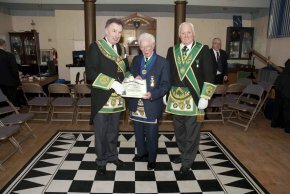 James Peddie presented a 50 year Diploma to Bro. Donald Forbes PM. On 27 December IPPGM Bro. 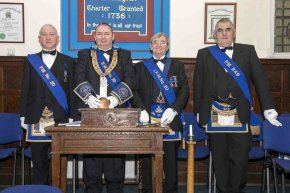 Archibald Chalmers attended the Annual Installation of Lodge St. John No. 20 in the Province of Lanarkshire Upper Ward. 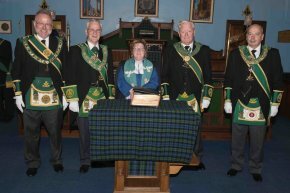 The Deputation from PGL Lanarkshire Upper Ward was headed by Bro. DPGM Alexander Brown, also in the Deputation was RWPGM Bro. Alexander Thomson. Bro. 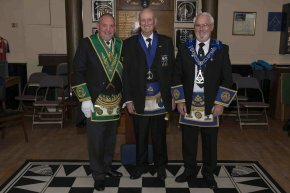 Richard Campbell was installed as RWM by Installing Masters Bro. Stuart Maxwell PM No. 20, Bro. 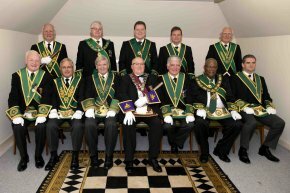 Thomas Meikle PM Lodge Newlands No. 949 and Bro Henry Campbell PM No. 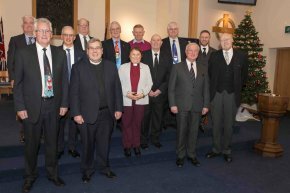 20 who is the father of the new RWM and the retiring RWM. On 29 November, RWPGM bro. 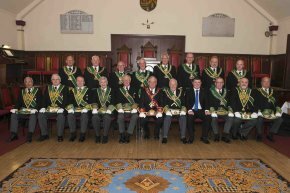 Robert Little attended the Installation of James C. Peddie as RWPGM of the Province of Glasgow. 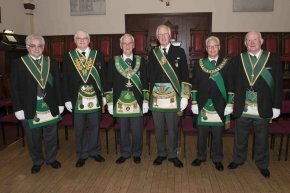 The Installation of the RWPGM and his Commissioned Office-bearers was conducted by The Most Worshipful Grand Master Mason Bro. Charles I.R. Wolrige Gordon of Esslemont, Grand Director of Ceremonies Bro. William Gauld and Grand Chaplain Bro. Rev Canon John Lindsay. The ceremony took place in Partick Burgh Hall. 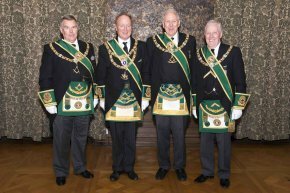 IPPGM Brother Archie Chalmers accompanied by PGL Office-bearers Bros. J S Cruickshank, George Reid and Ian Gemmill attended a Special Meeting of Lodge Royal Stuart No.1414 on Monday 24 November 2014, RWM Brother Edward Chamberlain presiding. Deputations from Grand Lodge and PGL Renfrewshire West, PGL Glasgow, PGLA were in attendance to witness an EAD being demonstrated for the benefit of the District Grand Master of Trinidad, Tobago and Grenada and his Brethren who accompanied him. A most enjoyable evening was had by all present. On 22 November, RWPGM Bro. Robert Little and IPPGM Bro. 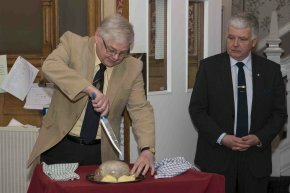 Archibald Chalmers attended the 150th Anniversary Rededication Ceremony of Lodge Robert Burns No. 440. RWM Bro. 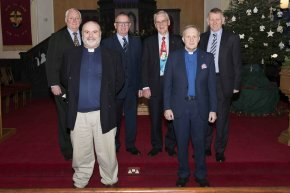 John Nesbitt welcomed a Deputation from the Provincial Grand Lodge of Lanarkshire Middle Ward, Sister Provinces and the District Grand Lodge of Central South Africa. 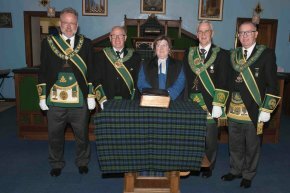 The ceremony was conducted by a Deputation from the Grand Lodge of Scotland headed by Bro. Maurice Wilson Substitute Grand Master assisted by Grand Director of Ceremonies Bro. 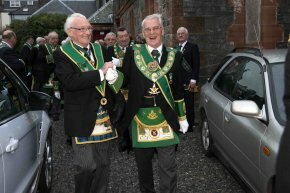 Ramsay McGhee and Grand Chaplain Bro. Robert Craig. After the ceremony, a dinner was enjoyed by all present and thereafter the usual Toasts were observed. At the end of the formal Harmony, RWM Bro. John Nesbitt presented Bro. Ramsay McGhee with a present to mark his final meeting as Grand Director of Ceremonies. 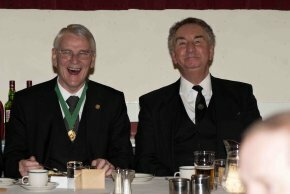 Brother Stewart Cruickshank (PGL Piper) and IPPGM Bro. 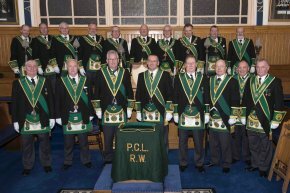 Archie Chalmers attended the Quarterly Communication of PGL Glasgow held on Tuesday 28 October 2014, RWPGM Bro. 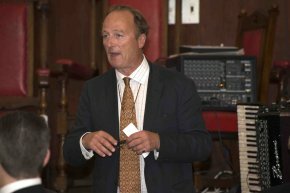 Alistair Henderson presided over the meeting. 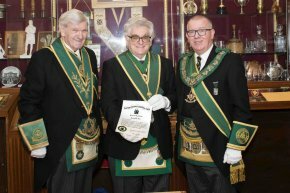 Brother Henderson in the course of the Meeting conferred Honorary PG Rank of Architect on, (an extremely shocked and stunned) Bro. Cruickshank in appreciation of his photographic contribution to PGL Glasgow during his term. This is a tremendous honour for Bro. Cruickshank and for the Province of Ayrshire as well as Lodge Ayr St. Paul No.204. The rank of Honorary Prov. Grand of Depute PGM was conferred on both Bro. John C. McLean and Bro. 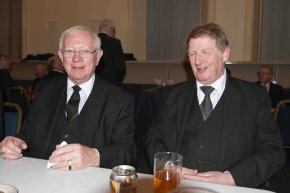 Donald J. Riddell both of whom retire as Past Substitute PGM’s. This being Bro. 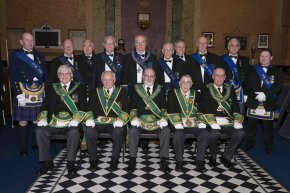 Henderson’s last occasion to preside over the PGL IPPGM Bro. Chalmers congratulated him on a very successful Commission and wished him and his successors all the best for the future. On 26 October, RWPGM Bro. Robert Little, PGLA Secretary Bro. Stuart McCall, PPSGW Bro. David Strachan, Bro. Iain Gemmell and Bro. 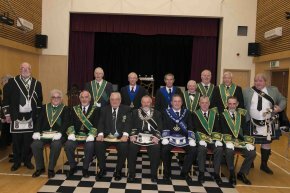 Stewart Cruickshank attended the Divine Service of the Provincial Grand Lodge of Galloway. RWPGM Bro. John Henderson extended a warm welcome to all. 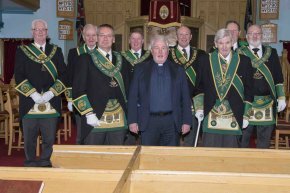 The Service was conducted by The Rev Canon David Bayne and was held in Ladyburn Masonic Temple, Glenluce. On 13 October, IPPGM Bro. 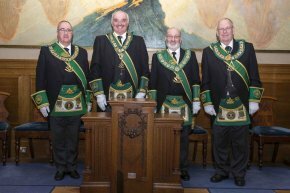 Archibald Chalmers joined a Deputation from the Provincial Grand Lodge of Glasgow on an informal visit to Lodge Montefiore No.753. The Deputation was headed by RWPGM Bro. 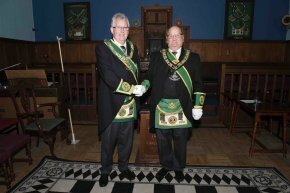 Alistair Henderson and was welcomed into the Lodge by RWM Bro. Gregory Barnett.The purpose of the meeting was to confer the 2nd degree on one Candidate. The second degree conferred was the new second degree and this only the second time used. 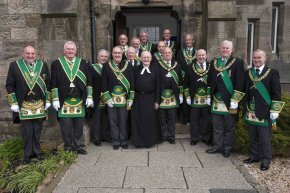 On 7 September, PGL Renfrewshire West held a Church Service of Thanksgiving celebrating the 275th anniversary of Alexander Drummond becoming the first Provincial Grand Master of the Western Counties of Scotland. RWPGM Bro. 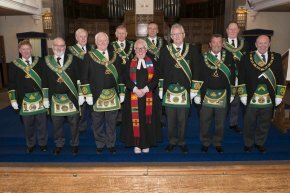 James Livingston of Renfrewshire West hosted the event in The Lyle Kirk, in Greenock, with the Service conducted by Provincial Grand Chaplain, Bro. Rev. David Mitchell. RWPGM Bro. Robert Little, Bro. Archibald Chalmers (Grand Inner Guard, William Connell, William McIntosh and Stewart Cruickshank attended from PGLA. 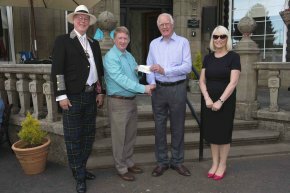 After the Service, RWPGM James Livingstone presented cheque's to the Kirk Session and the Organist Mr John Bell and a cheque for £2,000.00 to Grand Lodge for Prostate Cancer Scotland. On 23 August, RWPGM Bro. Robert Little, IPPGM Bro. Archibald Chalmers , Bro. Iain Gemmell and Bro. 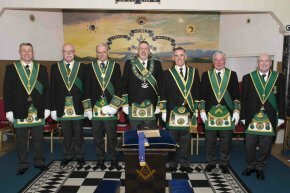 Stewart Cruickshank attended the Installation of the RWPGM and his Commissioned Office-bearers of the Provincial Grand Lodge of Aberdeenshire East. 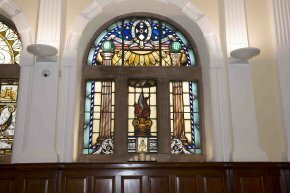 The Installation took place in the Masonic Temple in Peterhead, where the Most Worshipful Grand Master Mason Bro. 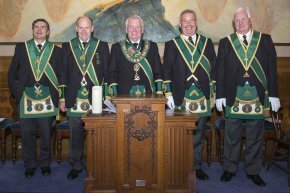 Charles Iain Robert Wolrige Gordon of Esslemont and Office-bearers of Grand Lodge Installed Bro. 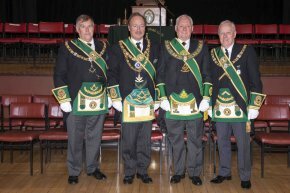 Ronald J. Simpson as Right Worshipful Provincial Grand Master along with his Commissioned Office-bearers. RWPGM Bro. Robert Little replied for the visiting Provinces at the close of the meeting. 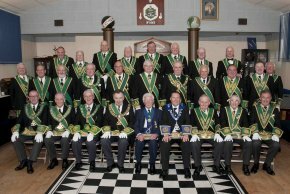 After the Installation the Celebration Dinner was held in the Britannia Waterside Inn Hotel with the usual speeches being observed. 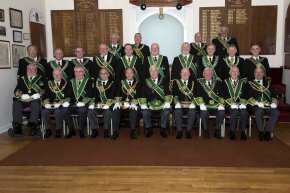 On 19 August, RWPGM of Kilwinning, Bro. T. Wilson Aitken welcomed a large Deputation from Sister Provinces to the Summer Communication. 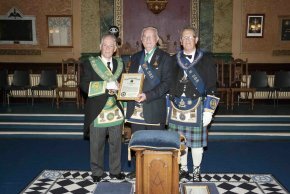 The Deputation was headed by the RWPGM Provincial Grand Lodge of Glasgow, Alistair Henderson which included RWPGM PGL Ayrshire Bro. 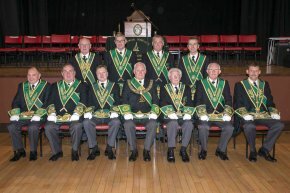 Robert Little and other members of the Provincial Grand Lodge. IPPGM Bro. 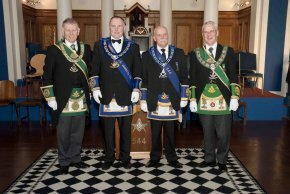 Archibald Chalmers joined a Deputation from the Provincial Grand Lodge of Glasgow on a visit to Lodge Dramatic No.571 on 31 st July. The Deputation was headed by RWPGM bro. 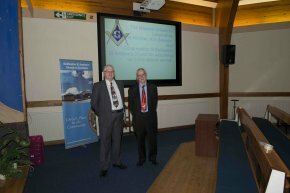 Alistair Henderson, and a warm welcome was extended by RWM Bro. Alan Kennedy. A FC degree was conferred on one candidate. On 29 June IPPGM Bro. 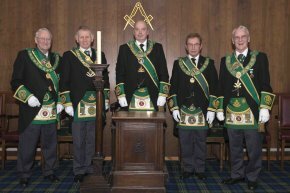 Archibald Chalmers joined a Deputation from the Provincial Grand Lodge of Glasgow on a visit to Lodge Pollok No.772. 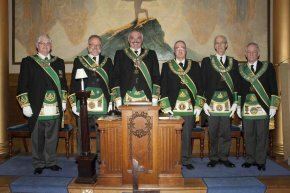 Before the meeting the construction and Masonic connections with the Pollokshields Burgh Hall was explained by IPM Bro. James Gray. 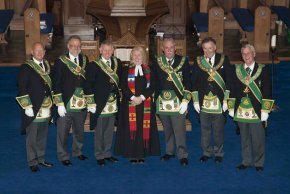 The Deputation from the Provincial Grand Lodge of Glasgow was headed by RWPGM Bro. Alistair Henderson and a warm welcome was extended by RWM Bro. Hector Munro. Also in the Deputation was Bro. Martin Boodhoo from the District Grand Lodge of Guyana. On 25 July IPPGM Bro. 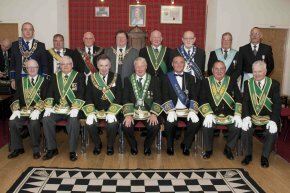 Archibald Chalmers attended the Communication of the Provincial Grand Lodge of Dunbartonshire. RWPGM Bro. John McCormack welcomed a small Deputation from Sister Provinces headed by RWPGM Bro. Kenneth Johnson. On 25 July, IPPGM Bro. 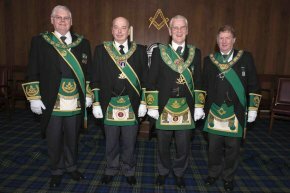 Archibald Chalmers joined a Deputation from the Provincial Grand Lodge of Glasgow, headed by RWPGM Bro. 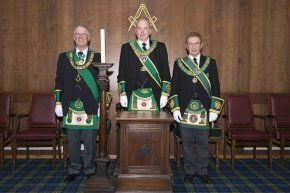 Alistair Henderson on a visit to Lodge The Glasgow Star No.219. RWM Bro. 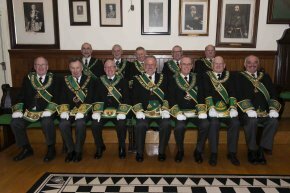 Keith Hodgson welcome a very large Deputation of RWMs from within and out with the Province of Glasgow headed by RWM Bro. Thomas McCrone of Lodge Griffin No. 1254. 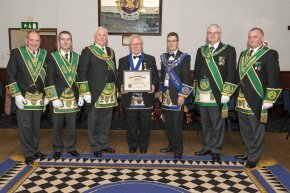 The Deputation from the Provincial Grand Lodge of Glasgow was then welcomed into the Lodge thereafter a team of RWMs from outside the Province of Glasgow conferred an EA degree on one candidate. On 24 July, IPPGM Bro. 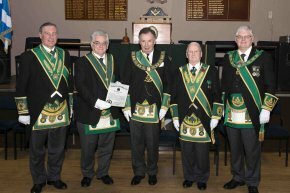 Archibald Chalmers joined a Deputation from the Provincial Grand Lodge of Glasgow headed by RWPGM Bro. 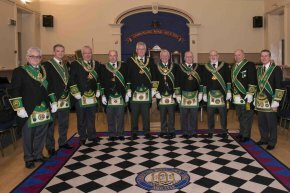 Alistair Henderson on a visit to Lodge Southern Cross No.1243. RWM Bro. Colin Munro welcomed the Deputation and then an EA degree was conferred on one candidate. Also welcomed into the Lodge was Bro. Lester Forman IPM Lodge Cacaus Island, No. 9664 EC. Bro Lester’s wife is an official at the Commonwealth Games. During the meeting RWPGM Bro. 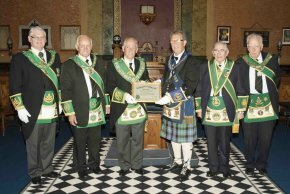 Alistair Henderson was made an Honorary member of Lodge Southern Cross. 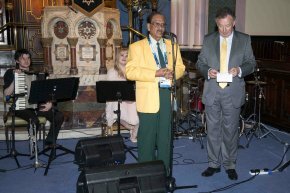 On 22 nd July, The Provincial Grand Lodge of Glasgow held an event in the Garnethill Synagogue to mark the beginning of the Commonwealth Games. The RWPGM welcomed all in attendance, including RWPGM Bro. Robert Little. 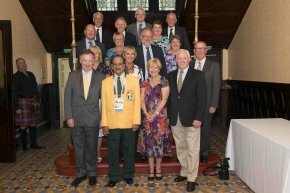 Brother Martin Boodhoo from the District Grand Lodge of Guyana was present as a representative from the Games. The entertainment was provided by Bro. Alan Beck (RWM Lodge Greenock Kilwinning No. 12) his wife Polly Beck, Ceilidh band Flung Aboot, and Scott Nicol. 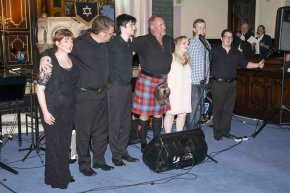 The evening was called The Almost Nearly Hogmanay Show and was enjoyed by all present. On 20 July, RWPGM Bro. 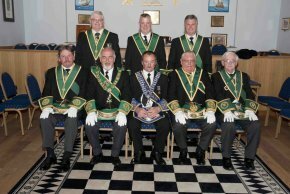 Robert Little attended the Annual Divine Service of Lodge Eskdale Kilwinning No.107. RWPGM Bro. 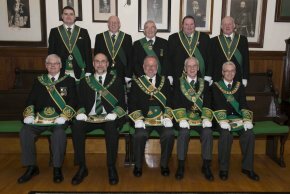 Robert Hughes of the Provincial Grand Lodge of Dumfriesshire headed the Provincial Deputation. The service was conducted by Rev. I Scott McCarthy in the Langholm Parish Church. RWM Bro. Kenneth MacQueen headed the parade to the Church from the Lodge accompanied by the local Brass Band. 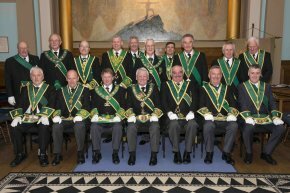 On Friday 21 June 2014 the RWPGM attended, and took part in an EA Degree conferred by reigning PGMs within the Allan Church, Bannockburn. 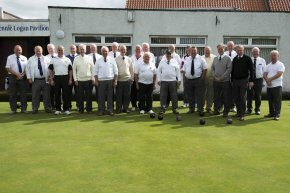 The host Lodge was Bannockburn Bruce and Thistle No.312. The Candidate was Mr Scott J. McCormick, son of the RWM Bro. James McCormick. The Most Worshipful Grand Master Mason was also in attendance. Our RWPGM was the Junior Deacon for the evening. The IPPGM Bro. Archie Chalmers and Bro. J S Cruickshank were also present. A memorable occasion for all who attended. The Charity collection amounted to £855. On 14h June, RWPGM Bro. 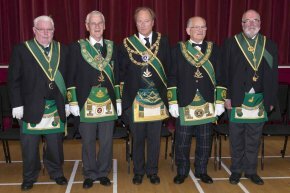 Robert Little accompanied by several brethren, attended the Installation of Bro. 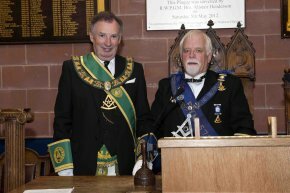 Robert Hughes as RWPGM of the Province of Dumfriesshire. 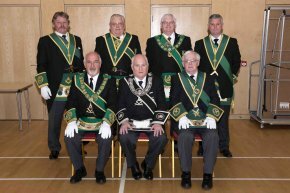 The Installation of the RWPGM and his Commissioned Office-bearers was conducted by the Depute Grand Master Mason Bro. Douglas Duncan, Grand Director of Ceremonies Bro. Ramsay McGhee and Grand Chaplain Bro. Rev. Robert Craig and took place in the Assembly Rooms, Dumfries. The Celebration Dinner was held after the ceremony, with the usual toasts and replies being observed. 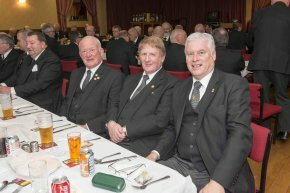 On 11 June, in the premises of Lodge Prince of Wales No.426, the Provincial Grand Lodge of Renfrewshire East held their Education Dinner. The speaker for the evening was W. Brother James Bartlettt, Mentoring Coordinator for the United Grand Lodge of England. Also present was the Most Worshipful Grand Master Mason Brother Charles I.R. 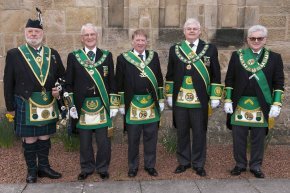 Wolrige Gordon of Esslemont, RWPGM Brother Robert Little, SPGM Brother Robert Stewart, Brother George Reid, Brother Stewart Cruickshank and providing the entertainment Brother Liam Stewart. IPPGM Bro. 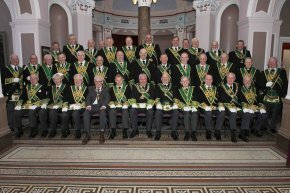 Archibald Chalmers attended the Regular Communication of the Provincial Grand Lodge of Glasgow on 10 June. RWPGM Bro. Alistair Henderson welcomed the Deputation from Sister Provinces headed by RWPGM Bro. Thomas Davidson of Lanarkshire Middle Ward. RWPGM Bro. 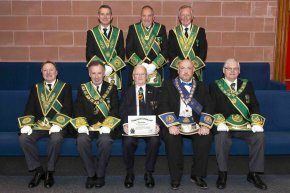 Alistair Henderson conferred Honorary Membership on Bros. Thomas McCrone DoC Lanarkshire Middle Ward, and Bro. 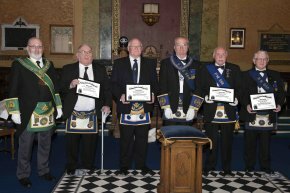 William Spencer PM Lodge Cambuslang Royal Arch No.114 in recognition of the service given to numerous Lodges in the Province of Glasgow. The annual BBQ at Marcus Humphrey House took place on the 8 June. The Drumhead service was conducted by Bro. Rev. 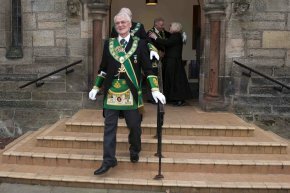 Robert Craig Provincial Grand Chaplain of Renfrewshire East (Who promised that the rain would cease at 3 minutes to 2.00 and it did). Councillor David Wilson declared the BBQ open. The President of the Widow’s Sons Bro. 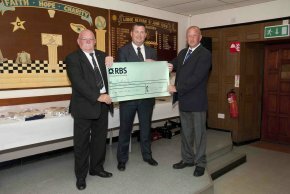 Ian Rennie presented a cheque for £6,000 to Bro. Marcus Humphrey of Dinnet for the Marcus Humphrey Masonic Home. This money was the proceeds of the Motor Cycle Ride round the 11 Provinces. Bro. Harry Jamieson PM of Ayr St. Paul No.204 presented a cheque to Wilma MacDonald, Manager of the Home. Bro. 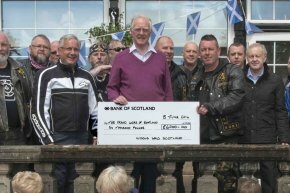 Ian Rennie presented the prizes for guessing the total mileage covered by the Bikers, first prize going to Bro. Bobby Fergusson. On 7 June, RWPGM Bro. 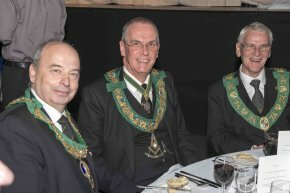 Robert Little attended the Installation of Bro. 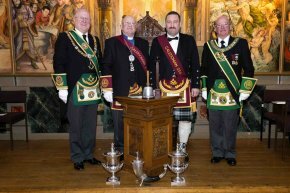 Thomas Constable Smith as RWPGM of the Province of Midlothian. 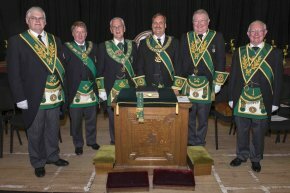 The Installation of the RWPGM and his Commissioned Office-bearers was conducted by The Most Worshipful Grand Master Mason Bro. Charles I.R. Wolrige Gordon of Esslemont, Grand Director of Ceremonies Bro. 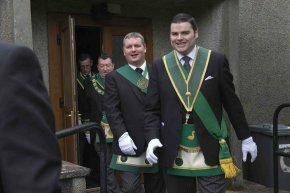 Ramsay McGhee and Grand Chaplain Bro. Rev. 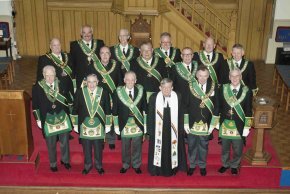 Canon John Lindsay and took place in the Masonic Temple of Lodge Dalkeith Kilwinning No.10. 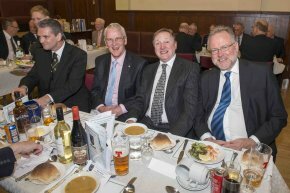 The Celebration Dinner was held in Easthouses Miners Club, with the usual toasts and replies being observed. On 5 June IPPGM Bro. 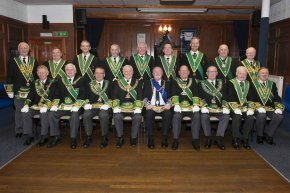 Archibald Chalmers attended a meeting of Lodge Greenock Kilwinning No.12. 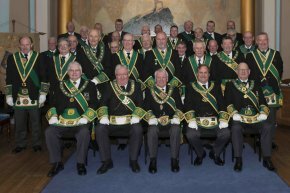 IPPGM attended as part of the Deputation from the Provincial Grand Lodge of Renfrewshire West headed by RWPGM Bro. James Livingstone. RWM Bro. 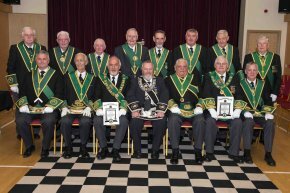 Alan Beck welcomed the Deputation and then a team of Past Masters from No.12 conferred the Entered Apprentice Degree on 5 candidates. On 3 June, IPPGM Bro. Archibald Chalmers, Bro. Stewart Cruickshank and Bro. 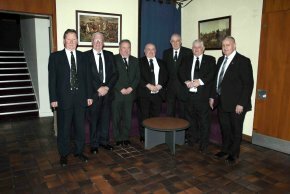 Iain Gemmell attended a meeting of Lodge Earraghaidheal No. 1822. RWPGM Bro. 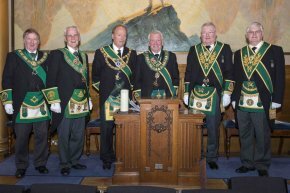 Kenneth Johnson invited the Brethren from Ayrshire to join the Deputation from The Provincial Grand Lodge of Argyll and the Isles. RWM Bro. James McKay welcomed the Deputation. IPPGM Bro. Archibald Chalmers delivered his talk on the Victoria Cross. RWPGM Bro. Kenneth Johnson carried out the Annual Provincial Visitation to the Lodge and granted the Lodge a clear minute. RWPGM Bro. 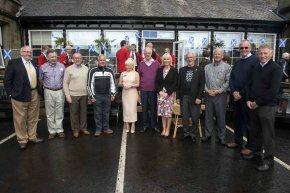 Kenneth Johnson then carried out the Consecration of the Community Centre in Dalmally, ably assisted by Provincial Grand Chaplain Bro. 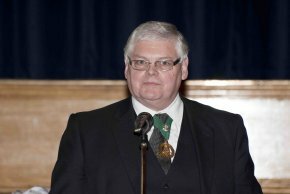 Kenneth Harvey, Provincial Grand Director of Ceremonies Bro. John Corbett and IPPGM bro. Douglas Craig. On 30 May RWPGM Bro. 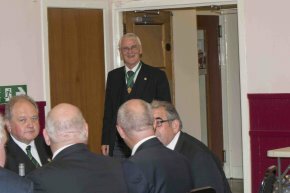 Robert Little attended the Past Masters Dinner at Lodge Nethan St. John 1289. Chairman IPM Bro. Andrew Masson welcomed the Brethren and introduced the visitors. Bro. Terry Stoddart RWM The Trades House of Glasgow No. 1241 gave a talk on the 4th Earl of Kilmarnock. On 18 May RWPGM Bro. Robert Little and Bro. 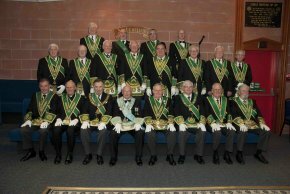 Stewart Cruickshank attended the Annual Divine Service of the Provincial Grand Lodge of Lanarkshire Upper Ward. The Service took place in Forth St. Paul’s Church, and was conducted by Rev. David Easton. 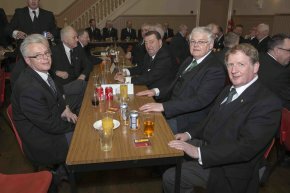 After the Service, Lodge Wilsontown Ironworks St John's Lodge No.236 provided refreshments and RWPGM Bro. Alexander Thomson gave a vote of thanks. On 17 May, IPPGM Bro. Archibald Chalmers (as Grand Inner Guard) and Bro. 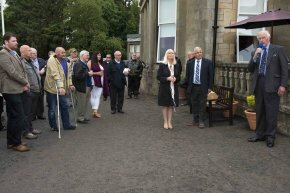 Stewart Cruickshank attended the 200th Jubilee re-dedication of Lodge Caledonian No. 254 in the Province of Forfarshire. RWM Bro. Rev. David Taylor welcomed the Deputations of Reigning Masters, Provincial Grand Lodge of Forfarshire, headed by RWPGM Bro. 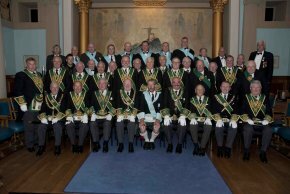 Alexander Christie and the Grand Lodge of Scotland headed by Depute Grand Master Bro. Douglas Duncan. The ceremony was conducted by Grand Chaplain Bro. Rev. Canon John C. Lindsay, Assistant Grand Director of Ceremonies Bro. 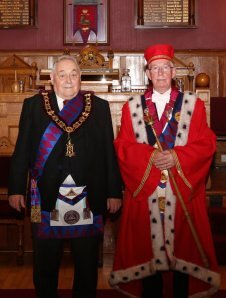 John McKenzie and Depute Grand Master Bro. Douglas Duncan. 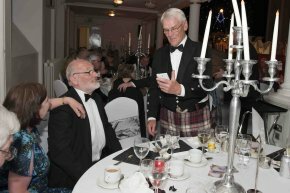 At the dinner, the usual toasts were given with an additional toast to the City of Dundee which was replied to by Cllr. Christina Roberts, Depute Lord Provost, City of Dundee. On 2 May, RWPGM bro. 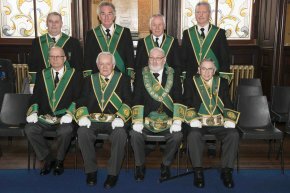 Robert Little headed a Deputation of Sister Provincial Grand Lodges into the Annual Installation of Elected Office-bearers in the Provincial Grand Lodge of Lanarkshire Upper Ward. The Deputation was welcomed by RWPGM Bro. Alexander Thomson. 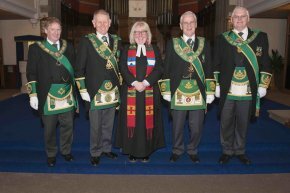 The Installation ceremony was conducted by both Provincial Grand Chaplains. 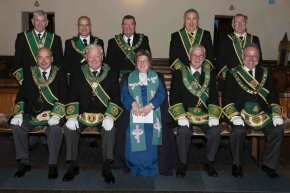 The Annual Divine Service of the Provincial Grand Lodge of Lanarkshire Middle Ward was held in Uddingston Old Parish Church on 27 April. The Service was conducted by the Rev. Fiona McKibbin and Senior Provincial Grand Chaplain, Bro. Rev. Peter Price. On 20 April, RWPGM Bro. 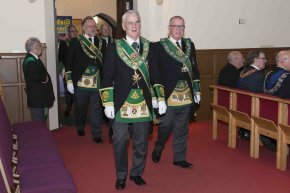 Robert Little attended the Annual Divine Service of the Provincial Grand Lodge of Renfrewshire East held in Stow Brae Parish Church Paisley. Right Worshipful Provincial Grand Master Bro. John S. Miller welcomed all to the Service conducted by Bro. Rev. Robert Craig, Provincial Grand Chaplain. On 19 April, IPPGM Bro. 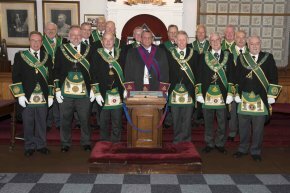 Archibald Chalmers attended the Annual Installation of Elected Office-bearers of the Provincial Grand Lodge of Argyll and the Isles held in Dunoon at the Lodge of Dunoon Argyll No. 335. RWPGM Bro. Kenneth Johnson welcomed the small Deputation from Sister Provincial Grand Lodges. 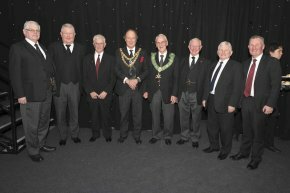 The Installation of Elected Office-bearers was carried out by the RWPGM. IPPGM Bro. 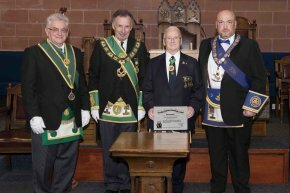 Archibald Chalmers presented a framed photograph taken at the Installation of RWPGM Bro. Kenneth Johnson and included the Brethren from Lodge St. John’s, Campbeltown. The photo was a present from IPPGM Bro. Archibald Chalmers and Bros. George Reid and Stewart Cruickshank. On 5 April, RWPGM Bro. Robert Little, Piper Bro. Stewart Cruickshank and Marshall Bro. 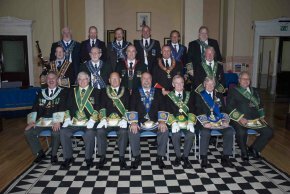 Iain Gemmell represented PGLA at the Installation of RWPGM Bro. 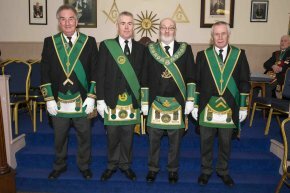 Andrew Lawrie and his Commissioned Office-bearers by the MWGMM Bro. Charles I.R. Wolrige Gordon of Esslemont in the Province of Aberdeen West. The installation was held in the new Community Centre, Newmachar. Bro. James Bell Grand Treasurer and Bro. 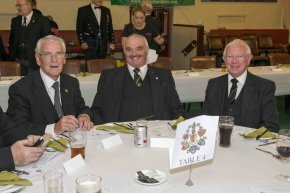 Archibald Chalmers Grand Inner Guard were also in attendance. On 1 April, IPPGM Bro. Archibald Chalmers and Bro. 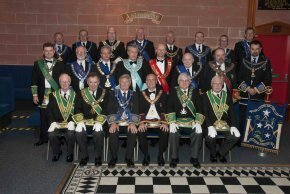 Stewart Cruickshank attended the Masters Dinner hosted by the Provincial Grand Lodge of Dunbartonshire. After enjoying the meal, IPPGM Bro. Archibald Chalmers entertained the company with his talk on The Victoria Cross. On 22 March, RWPGM Bro. 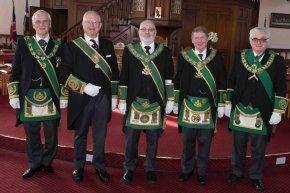 Robert Little headed a Deputation from PGLA into the Provincial Grand Lodge of Lanarkshire Upper Ward for the Installation of the RWPGM and his Commissioned Office-bearers. 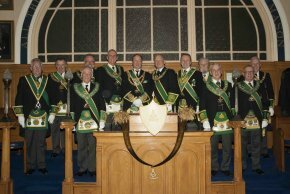 Also in attendance from Ayrshire was Bro. Archibald Chalmers IPPGM in his role as Grand Inner Guard. Bro. 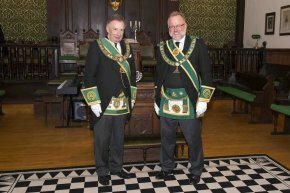 Alexander Thomson was installed as RWPGM by The Right Worshipful Depute Grand Master Mason Bro. 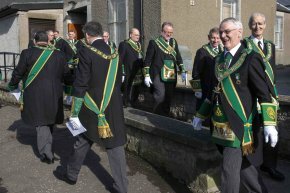 Douglas Duncan assisted by Office-bearers from The Grand Lodge of Scotland. RWPGM Bro. 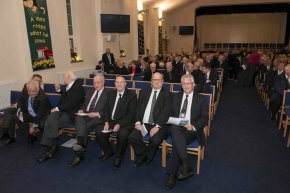 Andrew McKinnon PGL Stirlingshire headed a Deputation of Sister Provinces into the Annual Installation of elected Office-bearers of the Province of Lanarkshire Middle Ward on 7 March. The Deputation was welcomed by RWPGM Bro. Thomas Davidson. Representing PGLA was SPGM Bro. James Bell, PPGM Bro. Adam Cunningham and Piper Bro. Stewart Cruickshank. 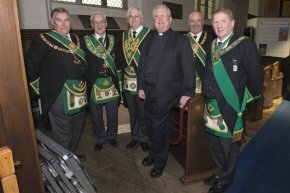 The Installation was carried out by IPPGM Bro. James Jack, PPGM Bro. Kenneth Kennedy and PPGM Bro. George Kelly. After the Installation PGL Chaplain Bro. Peter Price was made Honorary Depute Provincial Grand Master by RWPGM Bro. Thomas Davidson. On 2 March RWPGM Bro. Robert Little, IPPGM Bro. 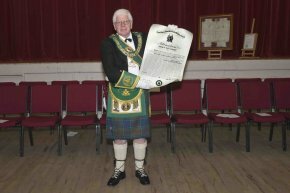 Archibald Chalmers, DPGM Bro. William Steel, PGLA IG Bro. 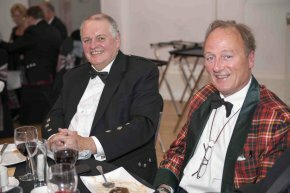 Duncan Stanners and PGLA Piper Bro. 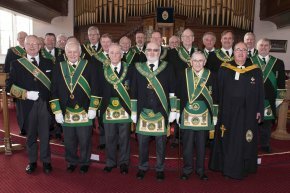 Stewart Cruickshank attended the Divine Service of the Provincial Grand Lodge of Stirlingshire held in the Allan Church, Bannockburn. The service was conducted by Rev. James Landels and RWPGM Bro. Andrew McKinnon thanked all for attending. Lodge Bannockburn Bruce and Thistle No. 312 hosted the Service and refreshments after the service. On 28 February RWPGM Bro. 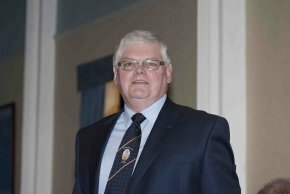 Robert Little headed a small Deputation form PGL Ayrshire to the Annual Installation of Elected Office-bearers of the PGL of Dumfriesshire. RWPGM Bro. Brian Porteous welcomed the Deputation from the Sister Provinces headed by RWPGM Bro. Alistair Henderson PGL Glasgow. 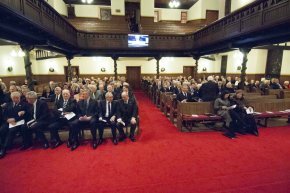 The Annual Installation of Elected Office-bearers for the Provincial Grand Lodge of Stirlingshire took place on 22 February in the Masonic Temple of Lodge Zetland in Grangemouth. RWPGM Bro. Andrew McKinnon welcomed a large Deputation from Sister Provinces headed by RWPGM bro. Alistair Henderson of PGL of Glasgow. 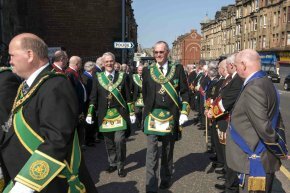 The Provincial Grand Lodge of Ayrshire was represented by RWPGM Bro. Robert Little, IPPGM Bro. Archibald Chalmers, SPGM Bro. James Bell and Bro. Stewart Cruickshank. 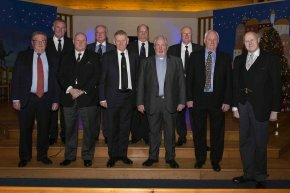 On 18 February, The Provincial Grand Lodge of Kilwinning held their half Annual Communication and Installation of Elected Office-bearers. RWPGM Bro. 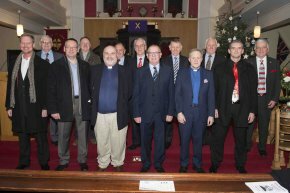 Wilson Aitken welcomed a large Deputation from fourteen Sister Provincial Grand Lodges headed by RWPGM Bro. Robert Little PGLA. On 8 February Bro. 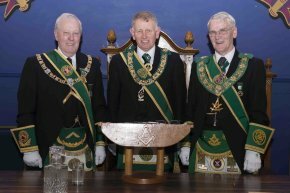 James Bell Grand Treasurer and Archibald Chalmers Grand Inner Guard representing Grand Lodge along with RWPGM Bro. 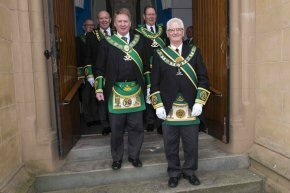 Robert Little and Stewart Cruickshank representing PGLA, attended the Provincial Grand Lodge of Dunbartonshire. RWPGM Bro. 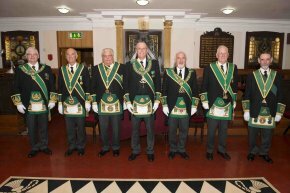 John McCormack welcomed a Deputation from Sister Provincial Grand Lodges headed by RWPGM Bro. James Livingstone. A Deputation from the Grand Lodge of Scotland headed by The Most Worshipful Grand Master Mason Bro. Charles I.R. Wolrige Gordon of Esslemont was then received. 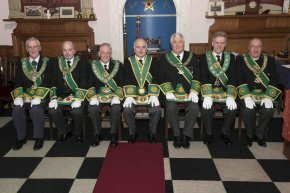 Depute PGM James Forrest then carried out the Installation of the Elected Provincial Grand Lodge of Dunbartonshire Office-bearers. The Most Worshipful Grand Master Mason assisted by Grand Director of Ceremonies Bro. Ramsay McGhee and Junior Grand Chaplain Bro. 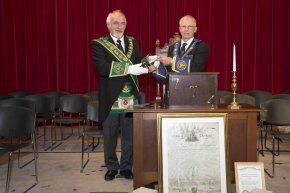 Robert Craig, then carried out the 275th re-dedication of the Province. After the meeting a Dinner to celebrate the re-dedication was enjoyed by all present. On 7 February 2014 RWPGM Bro. Robert little, SPGM Bro. Robert Stewart, Bro. William MacIntosh and Bro. 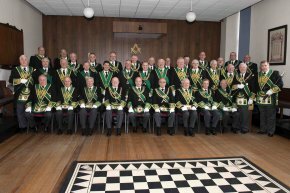 Stewart Cruickshank attended the Communication of the Provincial Grand Lodge of Renfrewshire West. This meeting was the Annual Installation of Elected Office-bearers. 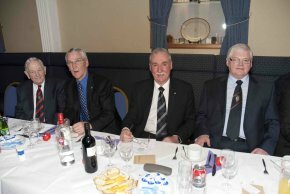 After the meeting a dinner was held to celebrate the 275th Anniversary of the West County Lodges. The RWPGM Bro. James Livingstone presented the Citizen of the year award to First Touch. 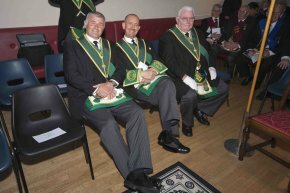 The main guest of the evening was The Grand Master Mason Bro. Charles I. R. Wolrige Gordon of Esslemont. On 10 January 2014, IPPGM Bro. Archibald Chalmers and bro. 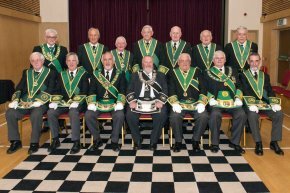 Stewart Cruickshank represented The Provincial Grand Lodge of Ayrshire at the Annual Communication of the Provincial Grand Lodge of Perthshire East. RWPGM Bro. Ronnie Forbes welcomed Deputations from the Provinces of Fife and Kinross, Stirlingshire, Perthshire West, Kilwinning and Ayrshire. On 15 December RWPGM Bro. Robert Little and IPPGM Bro. 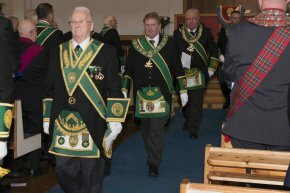 Archibald Chalmers attended the Carol Service hosted by Lanarkshire Freemasons. The Service was held in New Wellwynd Parish Church, Airdrie and was conducted by Rev. Robbie Hamilton. 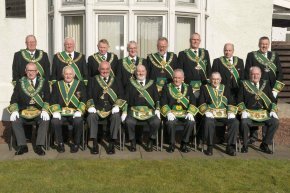 Readers for various portions of Scripture were from the Masonic Organisations in Lanarkshire. On 3 November, RWPGM Bro. 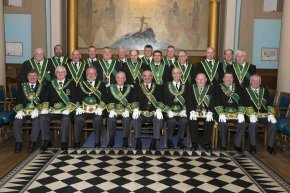 Robert Little attended the Annual Divine Service hosted by The Provincial Grand Lodge of Glasgow. The Service was conducted in Sherbrooke St. Gilbert’s Parish Church, Glasgow by Rev. Tom Pollock Minister of Sherbrooke St. Gilbert's, Bro. Rev. 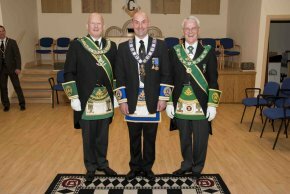 Gordon B. Armstrong Substitute Provincial Grand Master and Bro. Rt. Rev. Dr. Idris Jones Provincial Grand Chaplain. Also in attendance were IPPGM Bro. Archibald Chalmers, Bros. Stewart Cruickshank, Iain Gemmell and George Reid. On 5 October, RWPGM Bro. 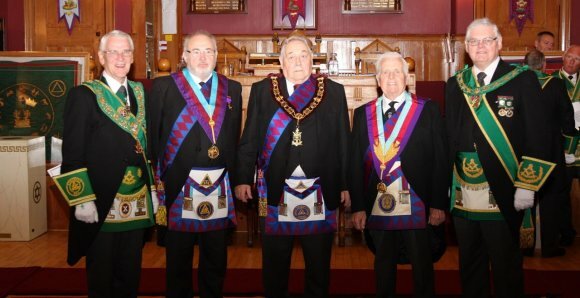 Robert Little and a number of Ayrshire Grand Lodge and Provincial Grand Lodge Office-bearers attended the Installation of the Provincial Grand Master of the Provincial Grand Lodge of Argyll and the Isles, Bro. Kenneth Johnson and his Commissioned Office-bearers. 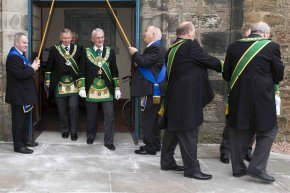 The Ceremony and Dinner were held in the Grammar School in Campbeltown, with the Ceremony being carried out by The Most Worshipful Grand Master Mason, Bro. Charles I.R. 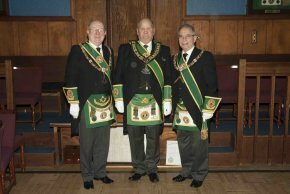 Wolrige Gordon of Esselmont, assisted by Grand Secretary, Grand Director of Ceremonies, and Assistant Grand D.o.C. RWPGM Bro. 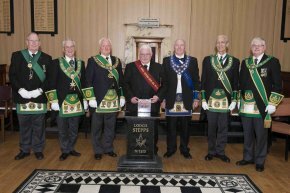 Robert Little headed the Deputation from the visiting Provincial Grand Lodges. After the Dinner, the usual toasts were observed with the Toast to the Province by IPPGM Bro. Archibald Chalmers and replied to by DPGM Bro. Donald Bannatyne. 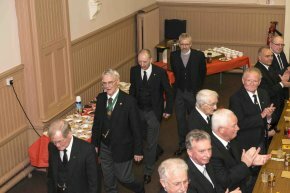 After the close many of those present made their way to the Lodge of St. John’s Campbeltown No. 141 where the model of King Solomon’s Temple was examined. On 21 September IPPGM Bro. 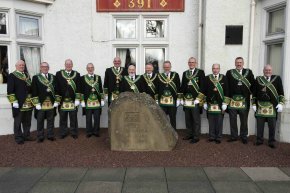 Archibald Chalmers visited Lodge Loch Lomond No. 1483 for their 60th Anniversary Celebration. RWM Bro. 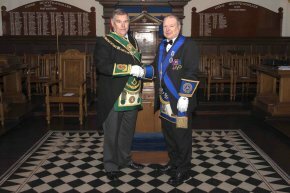 Fraser Robb, welcomed IPPGM Bro. Archibald Chalmers and Bro. Stewart Cruickshank into the Lodge as part of the Deputation from the Provincial Grand Lodge of Stirlingshire headed by RWPGM Bro. Andrew McKinnon. The ceremony was conducted by RWPGM Bro. Andrew McKinnon and the 2 Provincial Chaplains in an excellent manner. Bro. John McKenzie PM and RWM Bro. 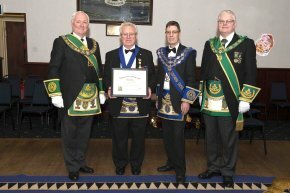 Robb then conferred Honorary Membership of 1483 on RWPGM Bro. Andrew McKinnon. On 15 September, RWPGM Bro. Robert Little, IPPGM Bro. Archibald Chalmers, DPGM Bro. William Steel, Bro. Iain Gemmell,Bro. George Reid, and Bro. 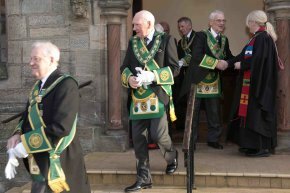 Stewart Cruickshank attended the Annual Church Service of the Provincial Grand Lodge of Lanarkshire Middle Ward held in Uddingston Old Parish Church. All attending were welcomed by RWPGM Bro. Tom Davidson with the service being conducted by Rev. Fiona McKibbin. On Monday 2 September 2013 IPPGM Bro. Archie Chalmers and PGLA Office-bearer Bro. 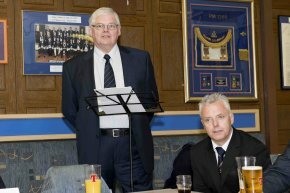 Stewart Cruickshank attended Lodge Callendar No.588 in Falkirk. 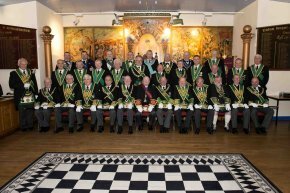 It was also the Annual Visitation of PGL Stirlingshire headed by RWPGM Bro. Andrew A. McKinnon. During the evening young brother invested his Father and Grand-Father with their Aprons on the occasion of their Initiation into the Craft. Quite a unique situation. Brother McKinnon was presented with his 50 year membership diploma by the RWM of his Mother Lodge. PM Bro. Joe Sharp was presented with his diploma and and neck jewel as an Honorary PG Architect by the PGM. Also attending was Bro. Rev Alex Shuttleworth MM No.135. On 10 August RWPGM Bro. Robert Little, IPPGM Bro. Archibald Chalmers, and Bro. 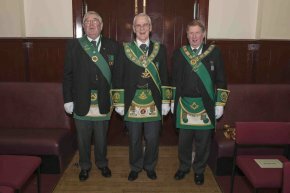 Stewart Cruickshank joined a Deputation from the Provincial Grand Lodge of Perthshire East headed by RWPGM Bro. 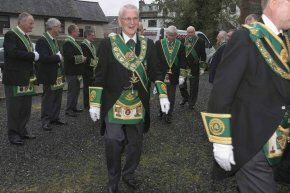 Ronald Forbes at the Centenary celebration of Lodge Auchtergaven No.1123. 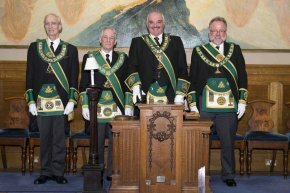 The ceremony was carried out by The Grand Lodge of Scotland headed by Depute Grand Master Bro. Douglas Duncan, assisted by Grand Director of Ceremonies Bro. Ramsay McGhee and acting Grand Chaplain Bro. Thomas Constable Smith. On 27 July, RWPGM Bro. Robert Little headed a Deputation from the PGLA and joined a Deputation from PGL of Argyle and the Isles. This combined Deputation which was headed by RWPGM Bro. 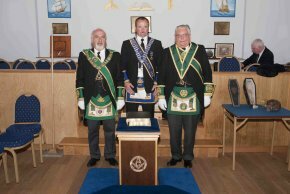 Kenneth Johnson, was welcomed into the PGL Dunbartonshire by RWPGM Bro. John McCormack for the PGL Dunbartonshire Communication. On 26 July, IPPGM Bro. Archibald Chalmers, Bro. Iain Gemmell and Bro. 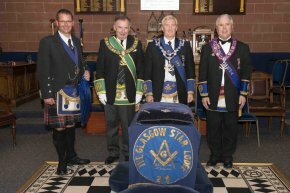 Stewart Cruickshank joined a Deputation from the Provincial Grand Lodge of Glasgow on a visit to The Glasgow Star Lodge No.219. RWM Bro. Keith Hodgson welcomed the Deputation headed by RWPGM Bro. Alistair Henderson. 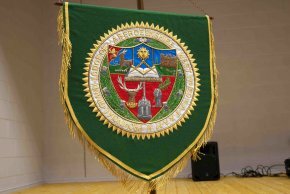 An EA degree was conferred by a Deputation of reigning Masters from inside and outside the Province of Glasgow including the RWM of St. Thomas, Murikirk No. 201 Bro. John Breckney. On 25 July, IPPGM Bro. Archibald Chalmers, Bro. Iain Gemmell and Bro. 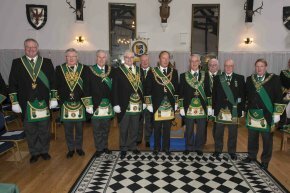 Stewart Cruickshank joined a Deputation from the Provincial Grand Lodge of Dunbartonshire on a visit to Lodge Barns o' Clyde No.1018. The Deputation was headed by RWPGM Bro. 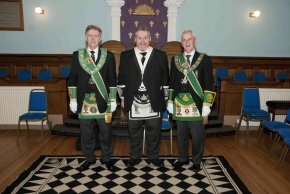 John McCormack of PGL Dunbartonshire. The Deputation was welcomed by RWM Bro. 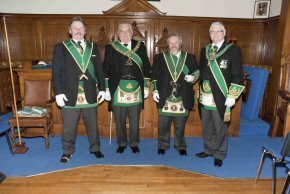 Frederick McKelvie and Lodge 1018 carried out a 3rd Degree. On completion of the degree, RWPGM Bro. 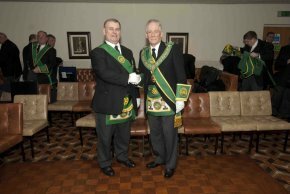 John McCormack and DPGM Bro. James Forrest were given Honorary Membership. On 29 June, Bro. 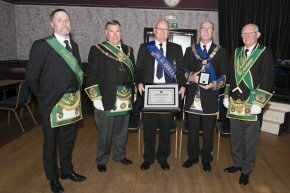 T. Wilson Aitken was installed as the Right Worshipful Provincial Grand Master of the Provincial Grand Lodge of Kilwinning. Also installed were his Commissioned Office-bearers. 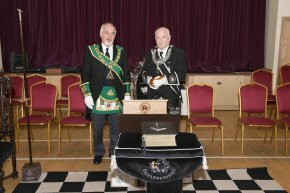 The Installation was carried out by The Most Worshipful Grand Master Mason, Bro. 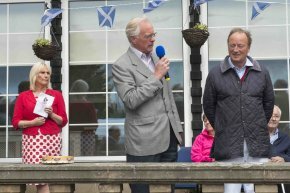 Charles Iain Robert Wolrige Gordon of Esslemont, assisted by Assistant Grand Director of Ceremonies Bro. William Gauld and Junior Grand Chaplain Bro. Rev. Robert Craig. RWPGM Bro. Robert Little proposed the Toast to the Province. On 19 June, IPPGM Bro. 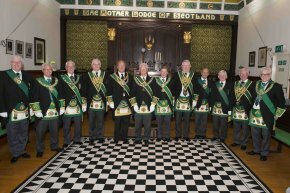 Archibald Chalmers visited Lodge St. Modan No. 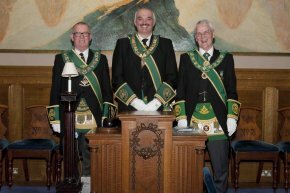 985 where he was welcomed as part of the Deputation from the Provincial Grand Lodge of Argyll and the Isles headed by the new RWPGM Bro. Kenneth Johnson. The Deputation was welcomed by RWM Bro. David Hall. 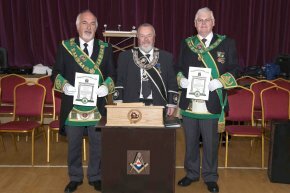 After the business was completed, 3 candidates received their 3rd degree. After the Degree, RWPGM Bro. Kenneth Johnson conducted the Annual Visitation. On 14 June, IPPGM Bro. Archibald Chalmers, Bro. George Reid and Bro. 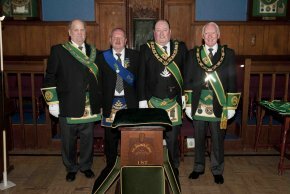 Stewart Cruickshank attended The Bridgeton and Glasgow Shamrock and Thistle Lodge No. 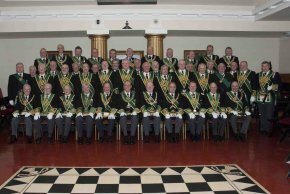 275 as part of a Deputation from the Provincial Grand Lodge of Glasgow headed by RWPGM Bro. Alistair Henderson. The Deputation was welcomed by RWM Bro. Robert Shaw. Thereafter a Deputation from Lodge Neptune No.419 headed by RWM Bro. 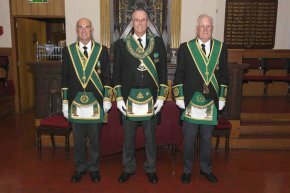 Hugh McAlpine conferred the 3rd degree on 2 candidates, one of whom was the son of the RWM of 275. On 11 June, IPPGM Bro. 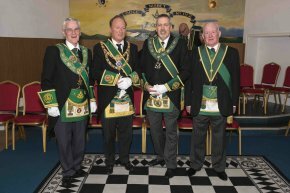 Archibald Chalmers visited Lodge Greenock Kilwinning No. 12. RWPGM Bro. 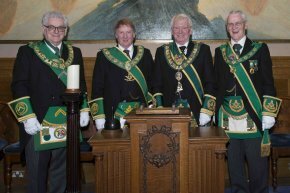 James Livingstone (Renfrewshire West), invited the IPPGM and Bro. Stewart Cruickshank, to join the Provincial Grand Lodge of Renfrewshire West into the Lodge where RWM Bro. Alan Breck welcomed the Deputation. The PM’s of the Lodge conferred a 1st degree on one candidate, the degree was dedicated to Bro. James Stirrat Adams PM. On 7 June IPPGM Bro. Archibald Chalmers attended the Annual Past Master’s Dinner of Lodge Nethan St. John No.1289. IPPGM Bro. Chalmers had arranged for Bro. 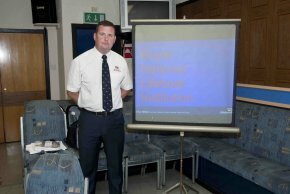 Robert McMaster, RWM of Lodge St. Johns Girvan No.237 to deliver a talk on the RNLI. The Chairman for the evening was Bro. Jim McVee PM. At the end of his presentation RWM Bro. McMaster was presented with a cheque for £300 for the RNLI funds. At the end of the evening, Bro. Scott McLean PM presented IPPGM Bro. 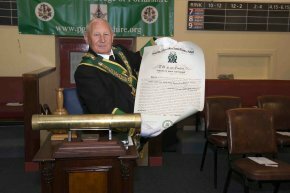 Archibald Chalmers with a gift to mark the work done for 1289 and his term as PGM. 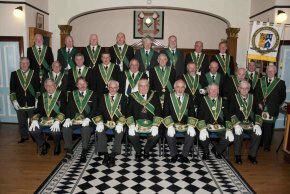 On 5 June RWM of Lodge Anima No. 1223 Bro. 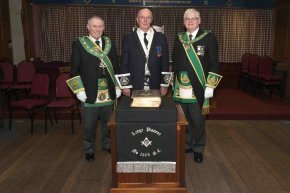 Alexander Ross Robertson, welcomed a Deputation from Lodge Broomhill No. 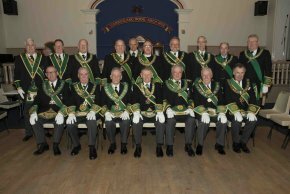 1595 headed by RWM Bro. Albert McLean into Lodge 1223. 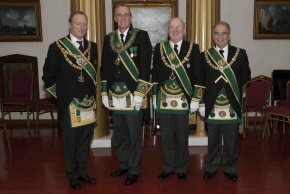 Thereafter a Deputation from The Provincial Grand Lodge of Glasgow headed by RWPGM Bro. Alistair Henderson was welcomed. 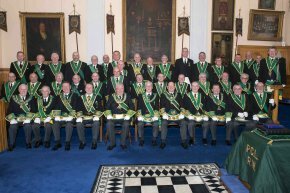 Included in the Provincial Deputation were Brethren from PGLA, IPPGM Bro. Archibald Chalmers, Bro. Iain Gemmell, Bro. George Reid and Bro. Stewart Cruickshank. 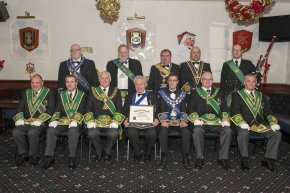 Lodge Broomhill conferred a FC Degree. On 24 May IPPGM Bro. 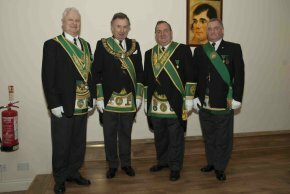 Archibald Chalmers visited Lodge Langside No. 955 where he was part of a small Deputation from The Provincial Grand Lodge of Glasgow, headed by SPGM Bro. James McMillan. After the Deputation was welcomed into the Lodge by RWM Bro. Thomas Logue, IPPGM Bro. Archibald Chalmers delivered his talk on the formation of the Burns Federation. After the meeting and during the harmony a quiz was held. On 23 May, RWPGM Bro. Robert Little, IPPGM Bro. Archibald Chalmers, Bro. George Reid and Bro. 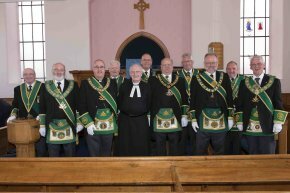 Stewart Cruickshank, had the pleasure of joining a Deputation from the Provincial Grand Lodge of Renfrewshire West on a visit to Lodge Inverkip Ardgowan, No. 1425. 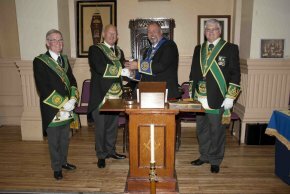 The Deputation was headed by RWPGM James Livingston, and was welcomed by RWM Bro. William McClarty. 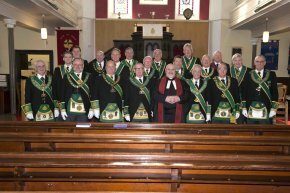 All present enjoyed a 1st degree on 2 candidates and the harmony thereafter. On 20 May, RWPGM Bro. Robert Little, IPPGM Bro. Archibald Chalmers and Bro. 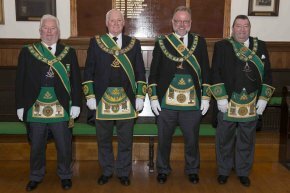 Stewart Cruickshank joined a Deputation from the Provincial Grand Lodge of Glasgow headed by RWPGM Bro. 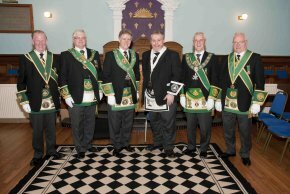 Alistair Henderson on a visit to Lodge Concord No.1341. RWM Bro. 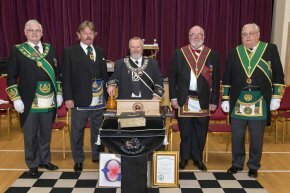 Martin Duncan welcomed the Deputation, which included representatives from Renfrewshire East, Stirlingshire and Dunbartonshire and handed over the mallet to RWPGM Bro. Alistair Henderson, who then proceeded to present Bro. George A.L. 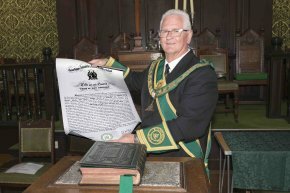 McEwan PM, Past Provincial Grand Master of Glasgow with his Diamond Jubilee Certificate. After the meeting IPM Bro. John Walker gave a talk on the Titanic, then all present enjoyed a fish supper. RWPGM Bro. Robert Little, IPPGM Bro. Archibald Chalmers,Bro. George Reid and Bro. 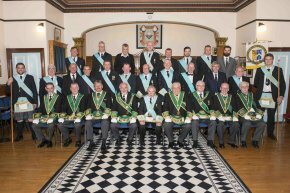 Stewart Cruickshank visited the Provincial Grand Lodge of Perthshire East for their Charity Meeting. RWPGM Ronnie Forbes extended a very warm welcome to the Brethren of Ayrshire. The object of the meeting was to raise money for charity and this was achieved by Lodge Union and Crown No. 307, Barrhead demonstrating their Auld FC. Degree. Lodge 307 was headed by RWM Bro. Paul Stewart. On 17 May RWPGM Bro. Robert Little, Bro. George Reid and Bro. 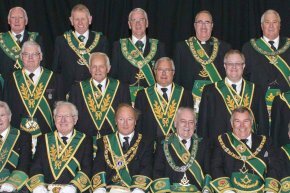 Stewart Cruickshank attended the Annual Installation of Elected Office-bearers of the Provincial Grand Lodge of Lanarkshire Upper Ward. RWPGM Bro. Thomas Millar welcomed the Deputation from the Sister Provincial Grand Lodges, headed by Bro. 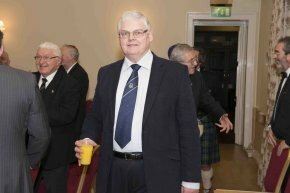 Andrew McKinnon RWPGM of the PGL of Stirlingshire. On 12 May RWPGM Bro. 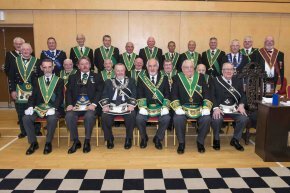 Robert Little attended the Annual Divine Service of the Provincial Grand Lodge of Lanarkshire Upper Ward. The Service conducted by Rev Mrs. Sarah Ross in the Forth St. Paul’s Parish Church. IPPGM Bro. William Langsborough welcomed all to the Service. In the evening RWPGM Bro. Robert Little, IPPGM Bro. Archibald Chalmers and Bro. 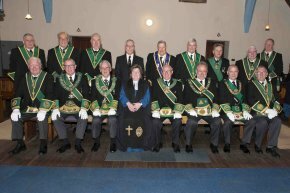 Stewart Cruickshank attended the Annual Divine Service of the District Grand Priory of Ayrshire at The West Laigh Kirk, Kilmarnock conducted by Rev. David Cameron. District Grand Prior Bro. John M. Turner welcomed all to the Service. On 9 May, IPPGM Bro. 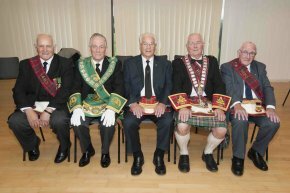 Archibald Chalmers attended the 50th Anniversary Meeting and Ceremony of Re-Dedication of Lodge Shalom No.1600. 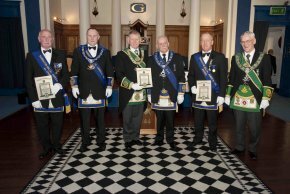 The Provincial Grand Lodge of Glasgow Deputation was headed by RWPGM Bro. Alistair Henderson. After being welcomed into the Lodge by RWM Br. 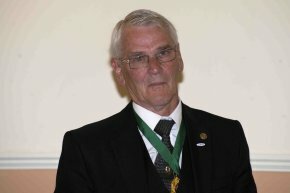 David WM Black, RWPGM Bro. Alistair Henderson and PG Chaplain The Right Rev. Bro. Idris Jones carried out the ceremony of Re-Dedication. At the celebration dinner IPPGM Bro. 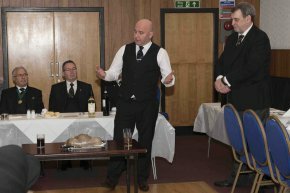 Archibald Chalmers delivered the toast to Lodge Shalom. 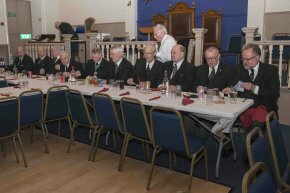 On 27 April, Lodge St. Andrew No.544, Coatbridge held a special meeting and dinner to celebrate 50 years (to the day) of inter visitations with Lodge St James (Kilwinning) Tarbolton No.135. 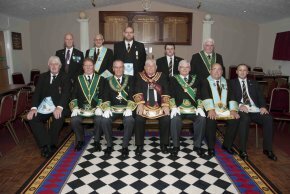 The Lodge was opened by RWM Bro. William Carson of 544 and all positions filled with Office-bearers from both Lodges. RWM Bro. 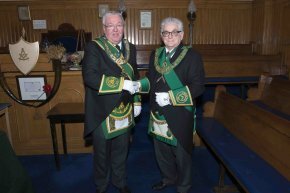 William Carson then welcomed a Deputation from the Provincial Grand Lodge of Lanarkshire Middle Ward, headed by RWPGM Bro. Thomas Davidson, the Deputation included RWPGM of PGLA Bro. Robert Little. RWM Bro. 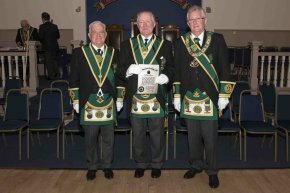 Ian Davidson of 135 assisted by Office-bearers from both Lodges then conferred a second degree. Bro. Alec McGuiness who attended the inaugural meeting was present. RWM Bro. 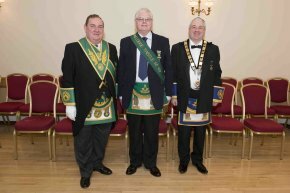 William Carson then conferred Honorary Membership on RWPGM Bro. Thomas Davidson along with Bro. Robert Ross and Bro. Gavin Barrie both PMs of 135. 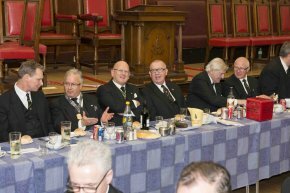 After photographs, the Lodge was closed and all brethren sat down to enjoy a dinner with speeches and entertainment. 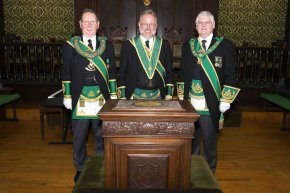 On 21 April, RWPGM Brother Robert Little, IPPGM Brother Archibald Chalmers and marshal Brother Stewart Cruickshank, attended the Annual Divine Service of The PGL Renfrewshire East. The Service was conduct by PG Chaplains Brother Rev. 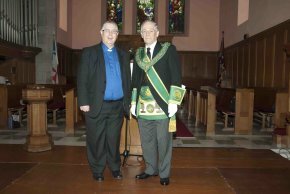 Robert Craig and Brother Pastor William Shirlaw at Stow Brae Kirk, Paisley. RWPGM Brother John Miller welcomed all present and thanked all for attending. On 20 April IPPGM Bro. Archibald Chalmers, Bro. Iain Gemmell, Bro. George Reid and Bro. 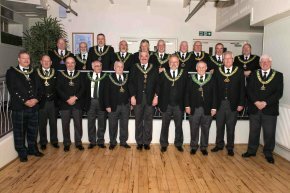 Stewart Cruickshank attended the Annual Installation of the Elected Office-bearers of the PGL of Argyll and the Isles in Oban. On 19 March RWPGM Bro. Robert Little, IPPGM Bro. Archibald Chalmers and PGLA Marshal Bro. 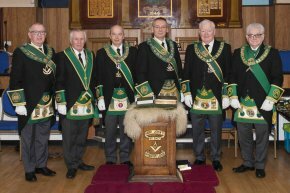 Stewart Cruickshank visited Lodge Pioneer, No. 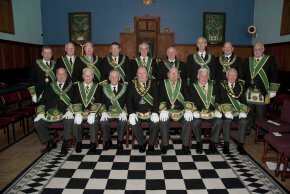 1305 where they joined the Deputation from the PGL Linlithgowshire headed by RWPGM Bro. Robert Scott. The Deputation was welcomed by RWM Bro. Iain Glennie and after the completion of the business, IPPGM Bro. Archibald Chalmers delivered his revised talk on The Copy Cats of Freemasonry. After the talk RWPGM Bro. 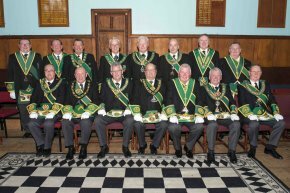 Robert Scott conducted the Annual Visitation of the PGL Linlithgowshire. On 16 March, RWPGM Bro. Robert Little, IPPGM Bro. Archibald Chalmers, SPGM Bro. Robert Stewart and Bro. 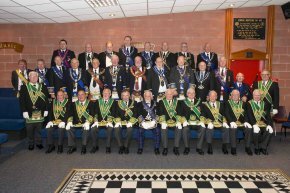 Stewart Cruickshank attended the Installation of RWPGM of Renfrewshire East, Bro. 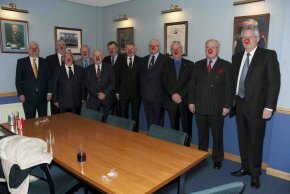 James Livingstone and his Commissioned Office-bearers at Greenock Town Hall. 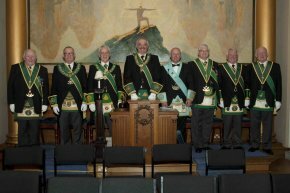 The Installation was carried out by MWGMM Bro. 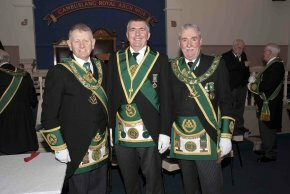 Charles Iain Robert Wolrige Gordon of Esslemont assisted by Grand Director of Ceremonies Bro. Ramsay McGhee. 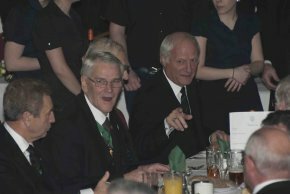 IPPGM Archibald Chalmers replied to the Toast to the Visiting Provincial Grand Lodges. On 15 March, RWPGM Bro. Robert Little, IPPGM Bro. Archibald Chalmers and Bro. 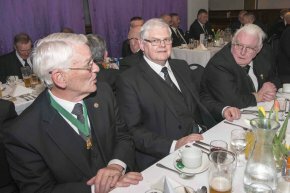 Stewart Cruickshank, attended the Provincial Grand Lodge of Lanarkshire Middle Ward Charity Dinner at the Masonic Hall, Church Street, Baillieston in aid of the Scouts. The Dinner was hosted by DPGM Bro. William Perry. There were two speakers, RWPGM of Bro. 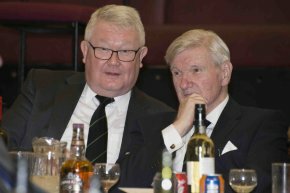 Glasgow Alistair Henderson, who spoke on his experiences as PGM, and IPPGM Archibald Chalmers who gave his talk on the Three Brethren who founded the Burns Federation. 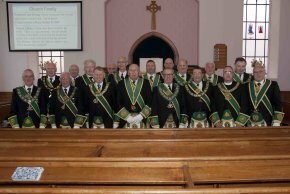 The Divine Service of the Provincial Grand Lodge of Stirlingshire was held on 3 March at Denny Old Parish Church, conducted by Rev. John Murning. RWPGM Bro. Andrew McKinnon welcomed all to the Service . 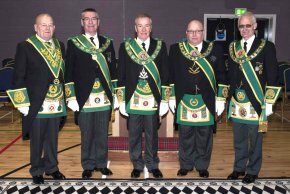 PGL Ayrshire was represented by RWPGM Bro. Robert Little, IPPGM Bro. Archibald Chalmers, Bro. Duncan Stanners and Bro. Stewart Cruickshank. 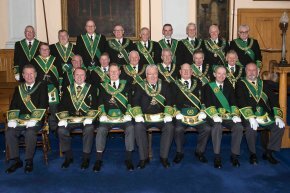 On 1 March 2013, IPPGM Brother Archibald Chalmers, PPGM Brother Adam Cunningham and Brother Stewart Cruickshank attended the Annual Installation of Elected Office-bearers of the PGL of Lanarkshire Middle Ward. 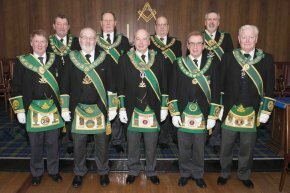 RWPGM Brother Thomas Davidson welcomed the Deputation from Sister Provincial Grand Lodges headed by RWPGM of PGL Glasgow Brother Alistair Henderson. On 22 February, RWPGM Bro. Robert Little, SPGM bro. Sam Peden and Bro. 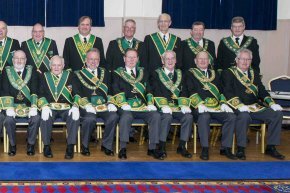 Stewart Cruickshank attended the Annual Installation of Elected Office-bearers of the Provincial Grand Lodge of Dumfriesshire. RWPGM Bro. Brian Porteous welcomed the Deputation from Sister Provincial Grand Lodges headed by RWPGM Bro. Robert Little. 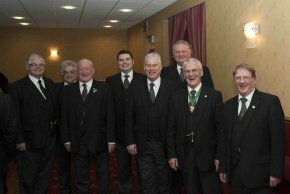 On 19 February 2013, The Provincial Grand Lodge of Kilwinning held their Installation of Elected Office-bearers. RWPGM Bro. David Bloomfield welcomed a large Deputation from Sister Provincial Grand Lodges headed by RWPGM Bro. Tom Davidson of Lanarkshire Middle Ward. 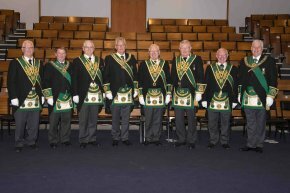 In the Deputation there were 10 other PGMs including RWPGM Bro. Robert Little. After the Installation was carried out by WSW Bro. T. Wilson Aitken (RWPGM Designate), IPPGM PGLA Bro. 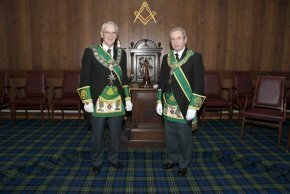 Archibald Chalmers and IPPGM Bro. 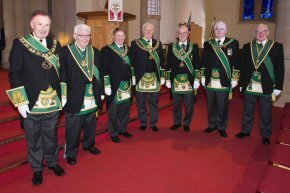 James Jack (Lanarkshire Middle Ward) were made Honorary Members of the Provincial Grand Lodge of Kilwinning. On 16 February 2013, RWPGM Bro. 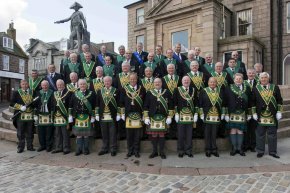 Robert Little attended the Annual Installation of Elected Office-bearers of the Provincial Grand Lodge of Roxburgh, Peebles and Selkirk Shires. The Deputation from Sister Provincial Grand Lodges were welcomed by RWPGM Bro. John F. Lamb. 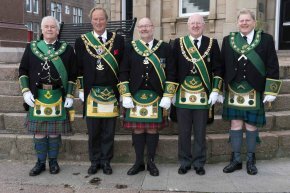 Also from Ayrshire were IPPGM Bro. Archibald Chalmers, Bro. Iain Gemmell, Bro. George Reid and Bro. Stewart Cruickshank.